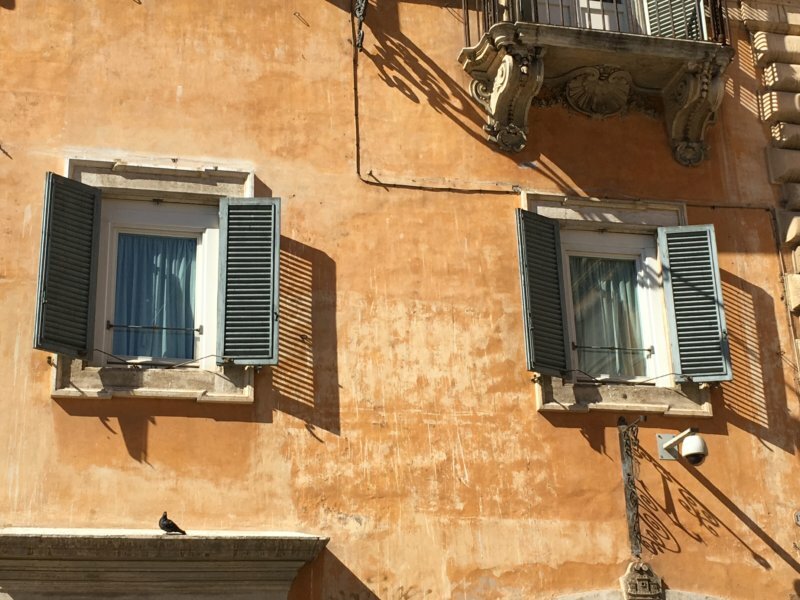 Rome is a city packed with history. There are historic sights at every corner and it’s hard to choose where to go. 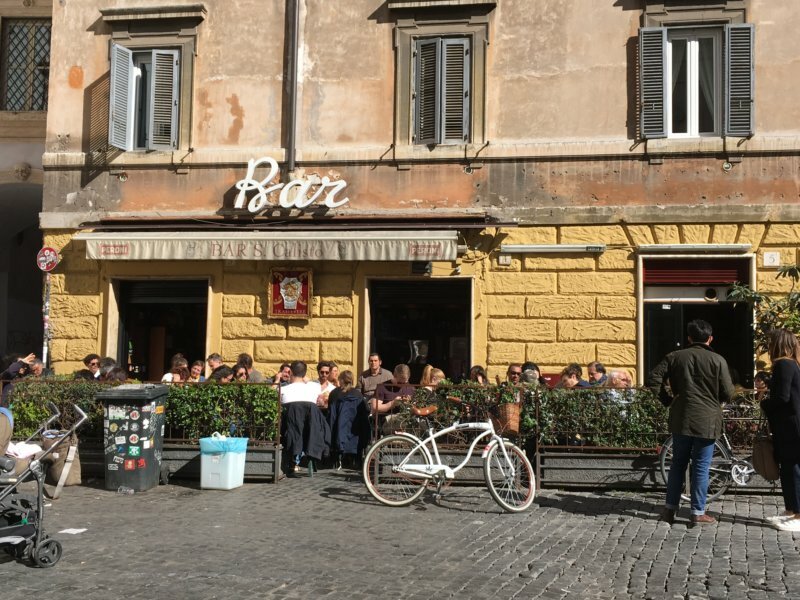 I made a walking map of Rome that shows you the top 10 sights of the Italian capital that is a city of 3 million people. My itinerary shows you the UNESCO World Heritage listed Old Town and takes you to fountains, squares, temples, churches and palaces. 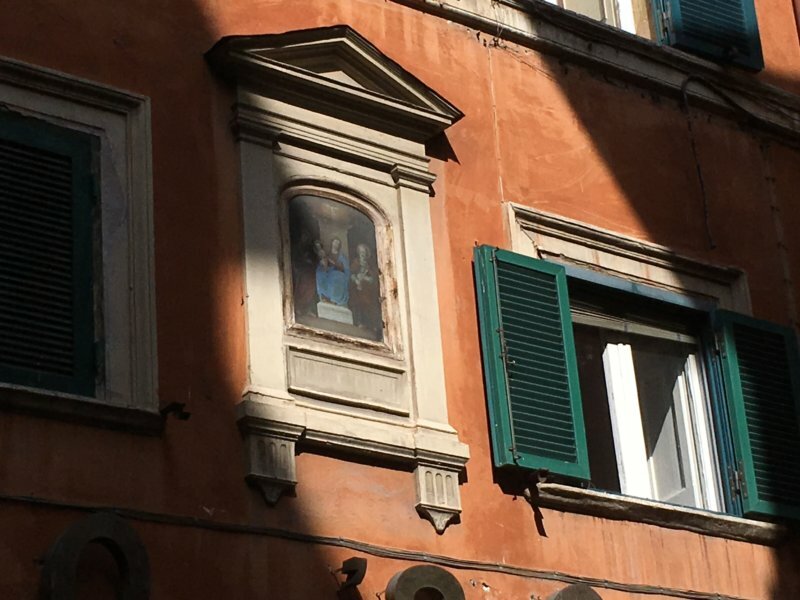 You will see that so many layers of history are present at your every step in Rome, the Eternal City. 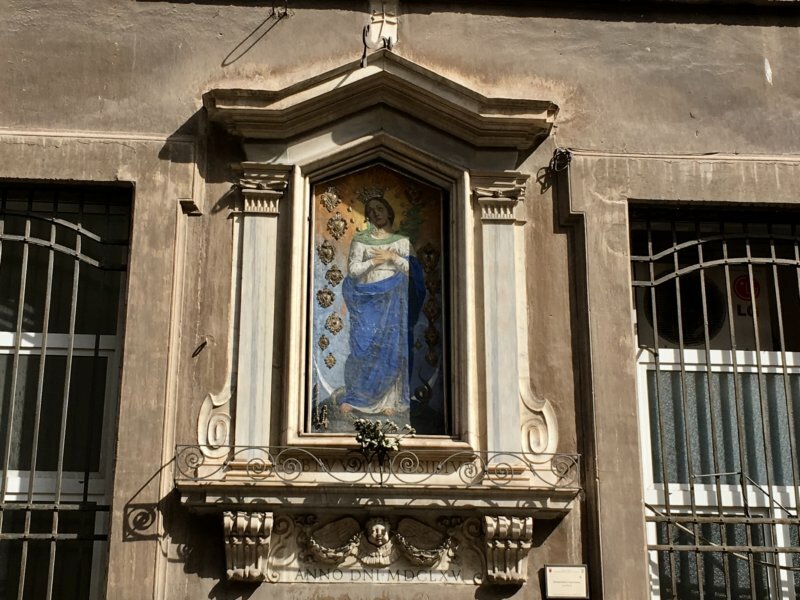 This is central Rome on a Google Map. 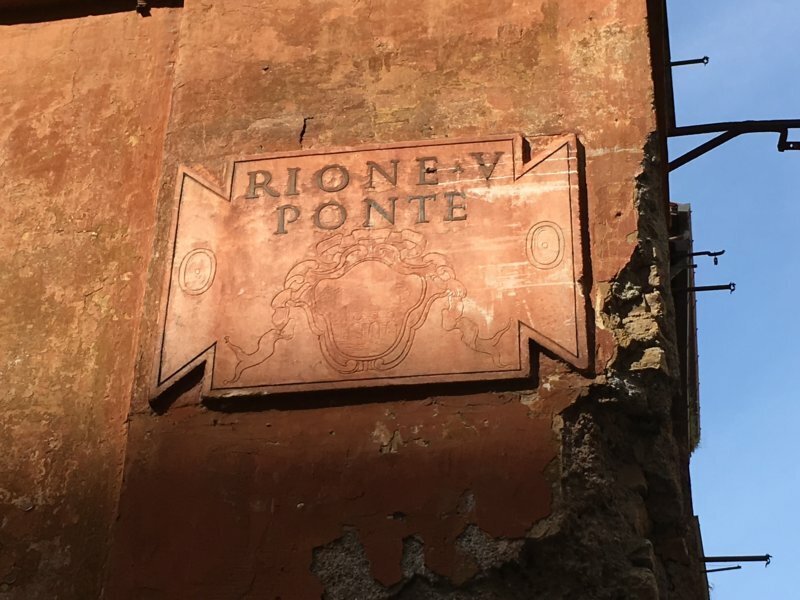 My walking itinerary is marked on the map and it connects the top 10 sights in Rome. Click on the map to open it in Google Maps on your cell phone while walking. 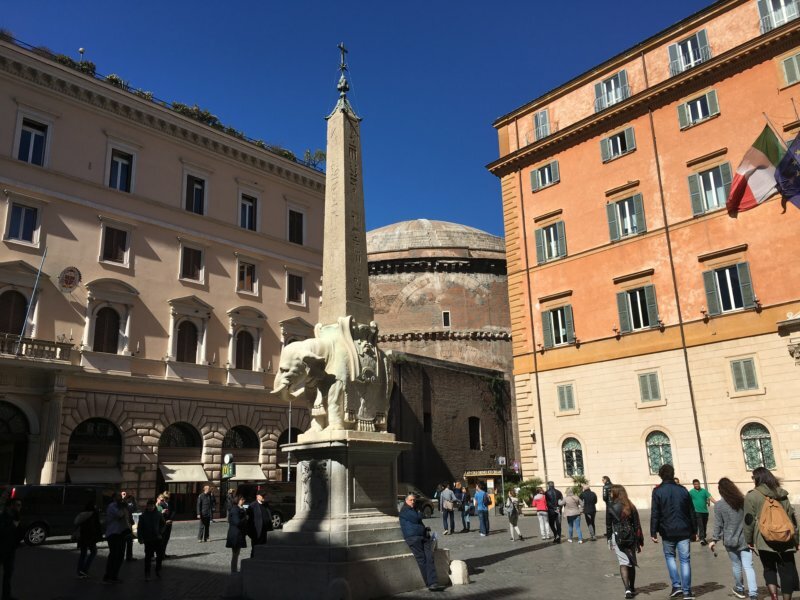 My Rome walking map itinerary starts on the Piazza della Rotonda where the Pantheon is. That’s in the center of the map. 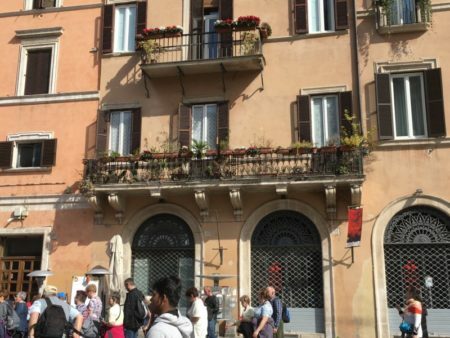 We walk through the Centro Storico (historical center) and cross the Tiber to the Vatican and Trastevere. 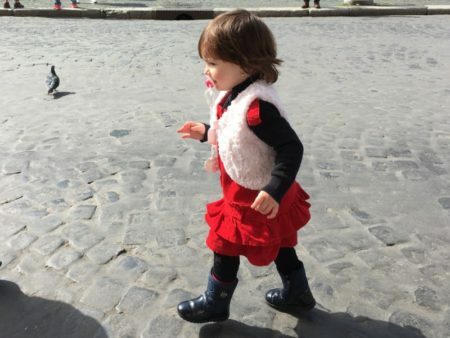 Later we will cross the Tiber again in the south for a walk in Ancient Rome after which two more favorite attractions remain, the Trevi Fountain and the Spanish Steps. 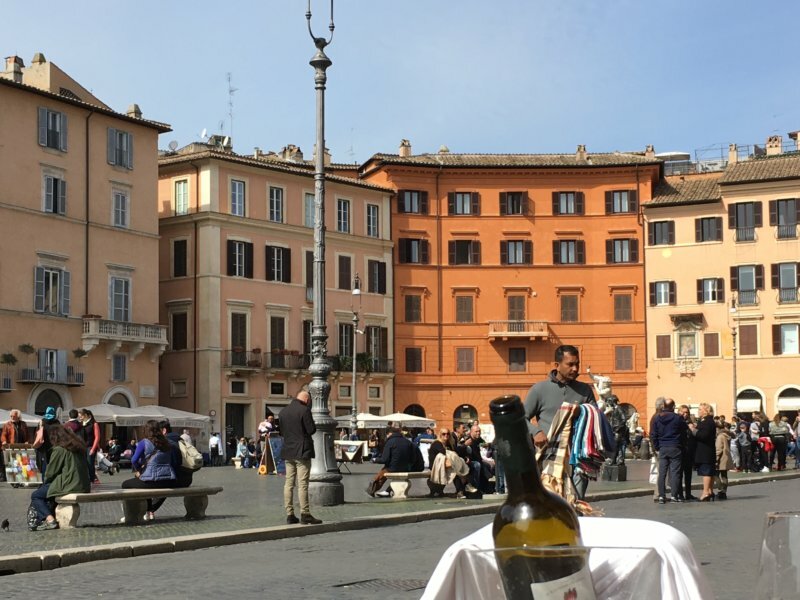 Piazza della Rotonda is at the very heart of Rome’s historical centre, Centro Storico. The small square is lined with historical houses and packed with people, at all times of the day. The Pantheon with its pink and grey granite columns clearly dominates the square. 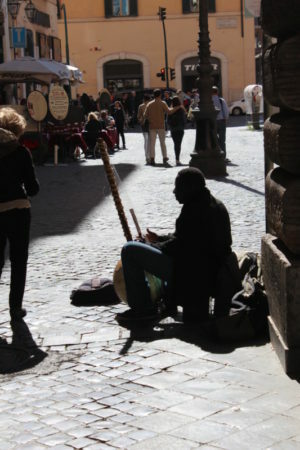 Crowds of locals and tourists, rows of pavement cafés, horses with their carriages, and art performers. This is Rome! Our Rome weekend is just going to start. 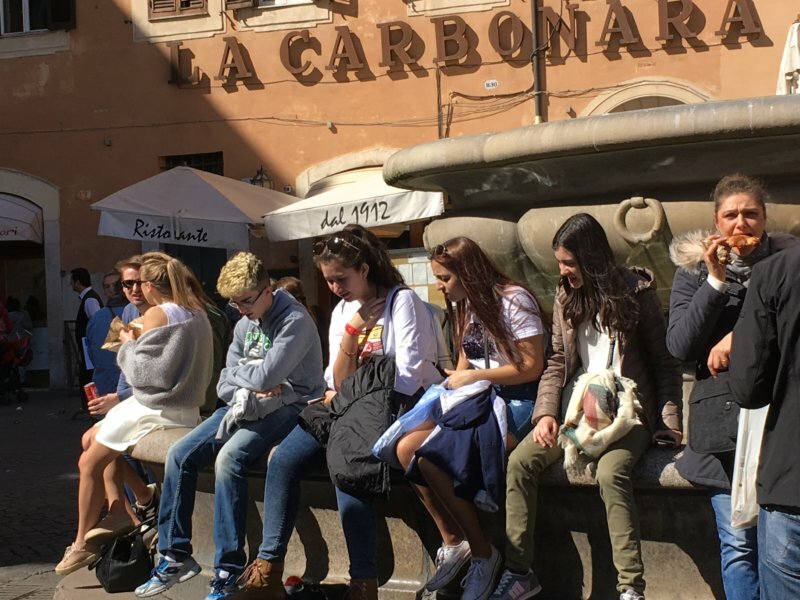 It is a sunny Saturday morning and Italian tourist groups are sitting around the old fountain in the center of the Piazza della Rotonda. 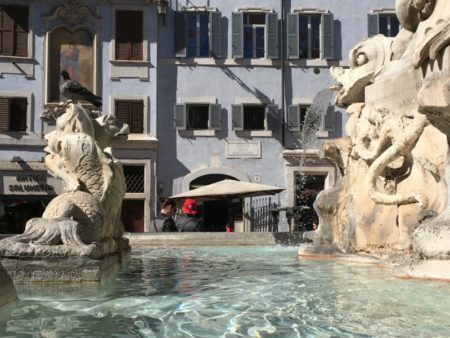 Wrong, this fountain is not old, it’s quite new… It was built in 1575 under Pop Gregory XIII, and the Egyptian-style obelisk was added 150 years later. It’s no wonder people like sitting here. I cant’ take my eyes off this amazing fountain that has so many fine details. But I know there are hundreds of fountains in Rome and this is just one of them. 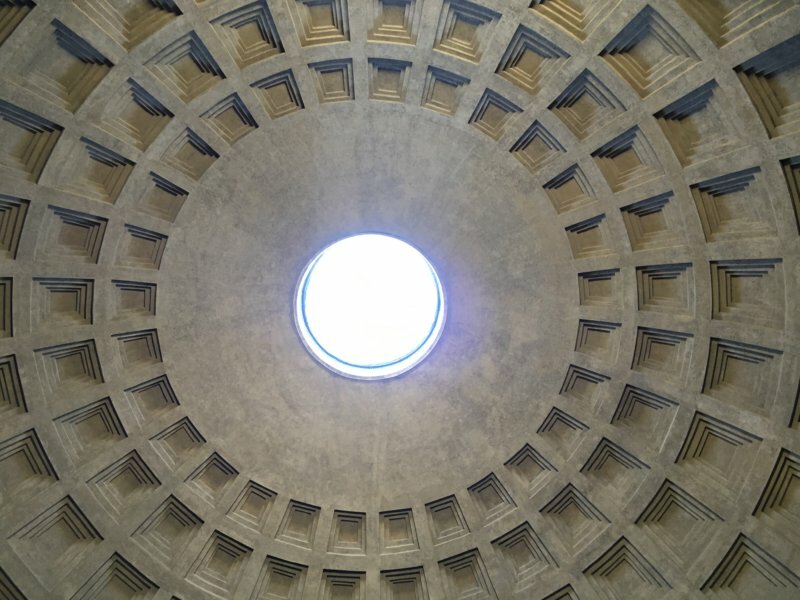 But – what people really come here for is the Pantheon. The Pantheon is huge. Even if I try the interior doesn’t fit in a photo. 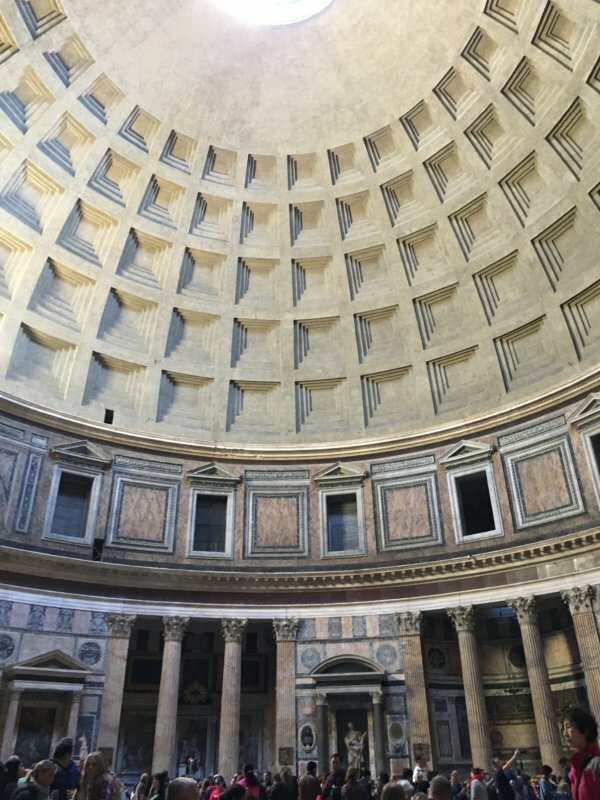 The Pantheon was built by Emperor Hadrian in AD 118-125 so it has now stood here for almost 2000 years. What a high standard of building quality they had in ancient Rome! 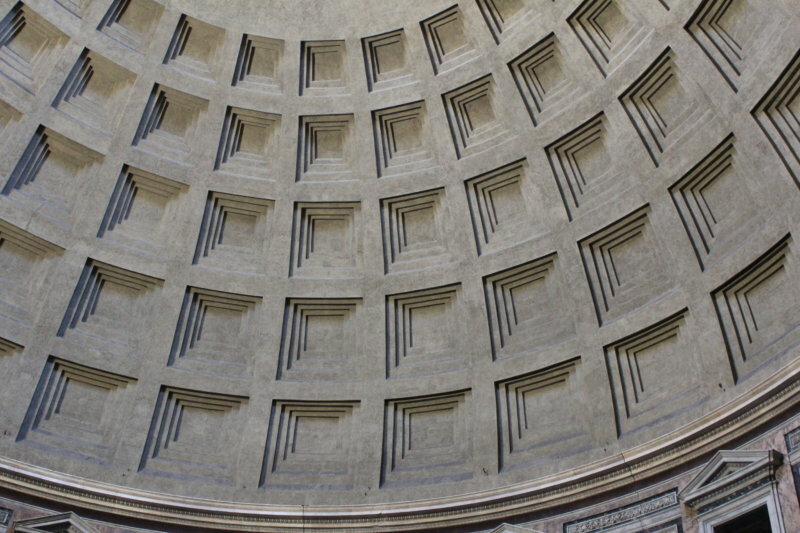 The Pantheon is by far the best preserved Roman temple in the world. The dome too is a masterpiece of engineering, it is exactly as wide as it is high and has a round oculus at the top that supports it. The walls below are 6 m thick and have arches inside for additional support. The oculus is 8 m wide and the only source of light in the hall. Yet it brings the needed daylight into the interiors and depending on where the sunlight comes from the dome looks different. Like the shades? The walls and floor are all covered with pieces of marble in different shades of pink, brown and grey. I just have to sit down and gaze at all this beauty. 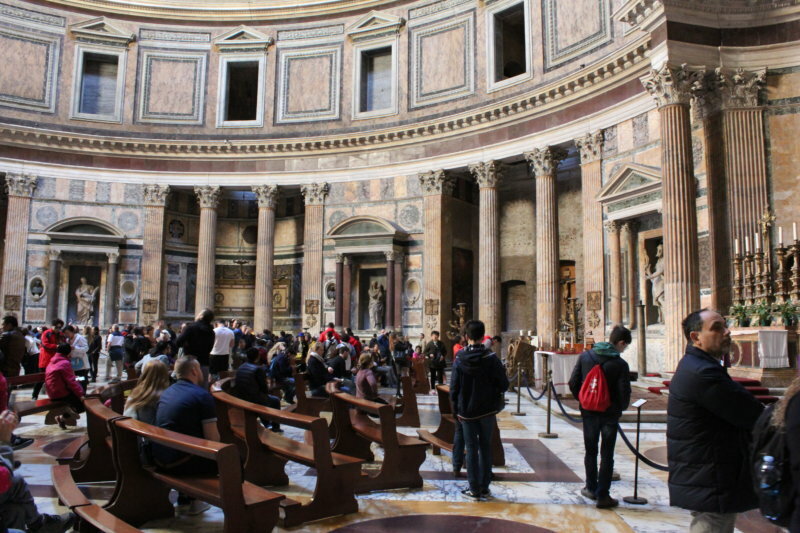 Many famous Italians from Rafael to emperors to more recent kings have been buried in the Pantheon. Now, let’s get back to the sunlight! This is Pantheon from the square behind, Piazza della Minerva. 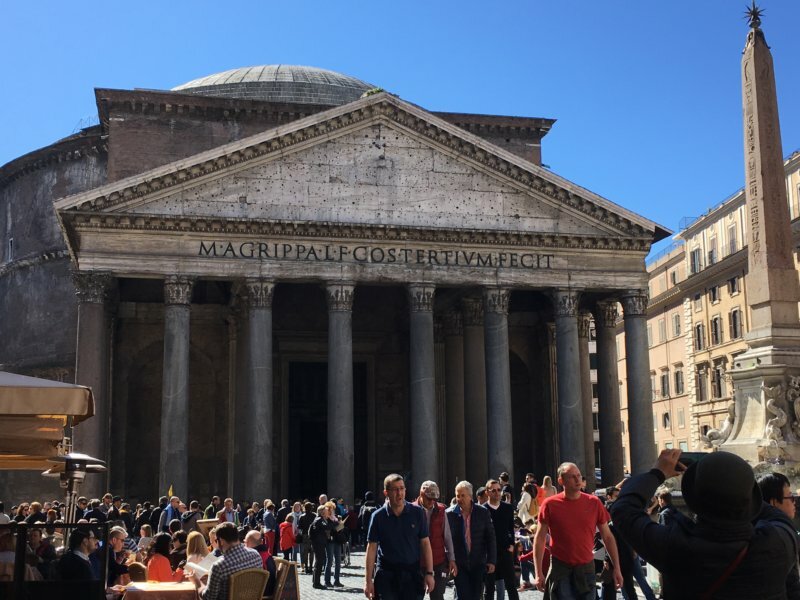 You would think a world class sight like the Pantheon would need some open space around it, but no. 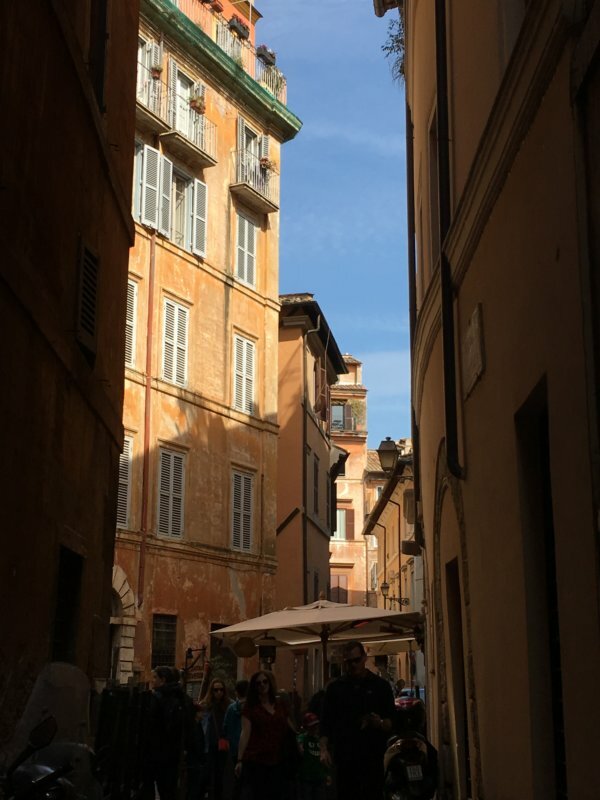 Rome is a living city and there’s no room for open spaces nor large squares. 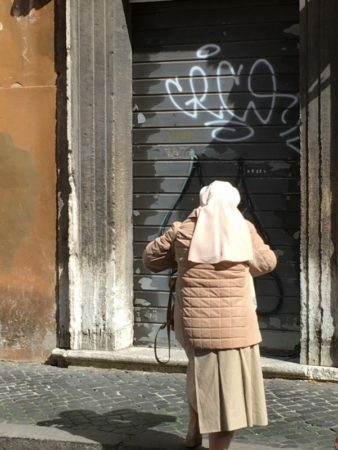 But that’s what gives Rome its charm. 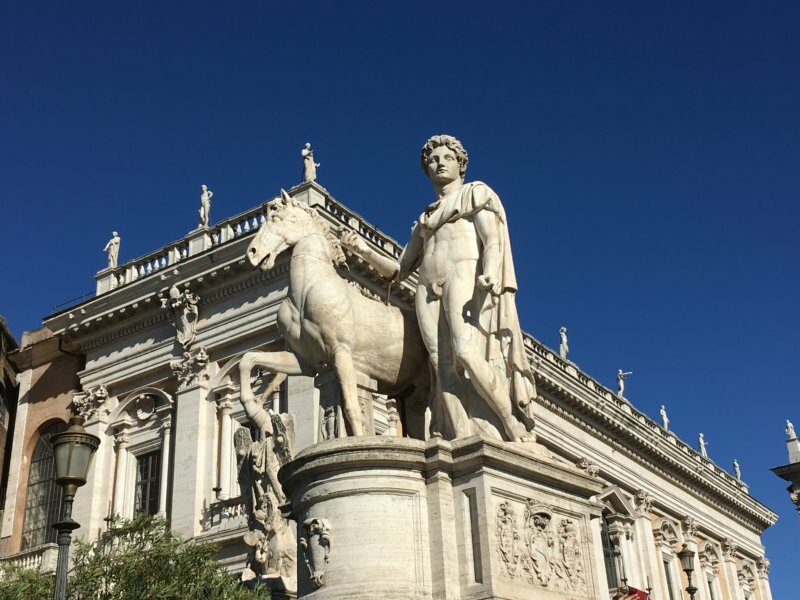 So do like Romans and wander through the Centro Storico, towards the next square Piazza Navona, our second Rome Top 10 attraction. 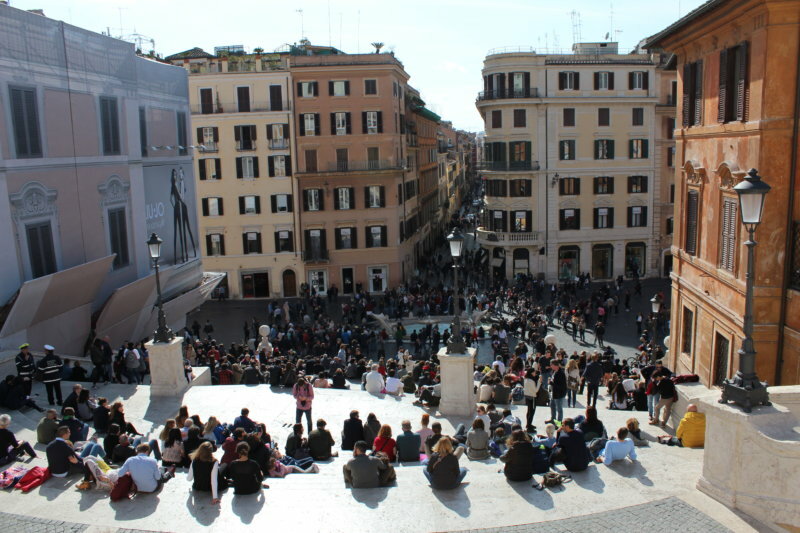 The Centro Storico in fact has one square with a bit more open space on it, the Piazza Navona. 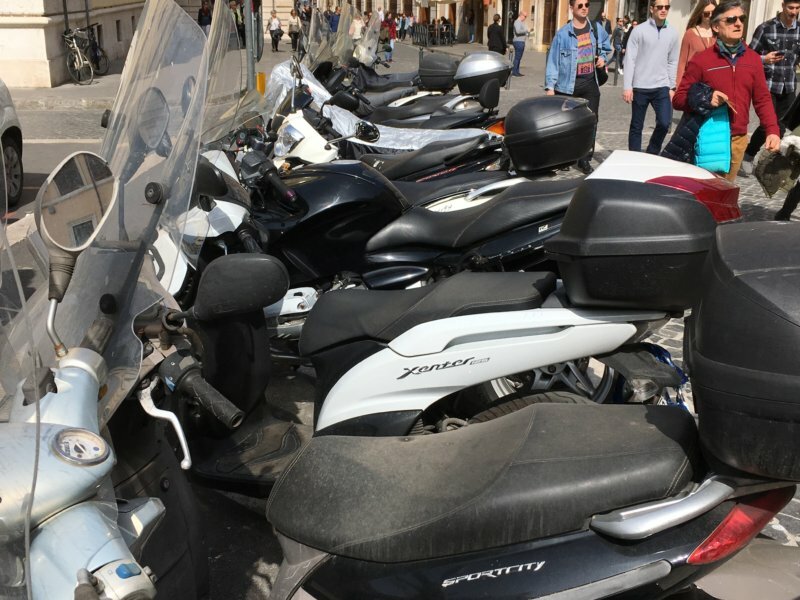 Piazza Navona is a long square shaped like a Roman racetrack but no races are held here. 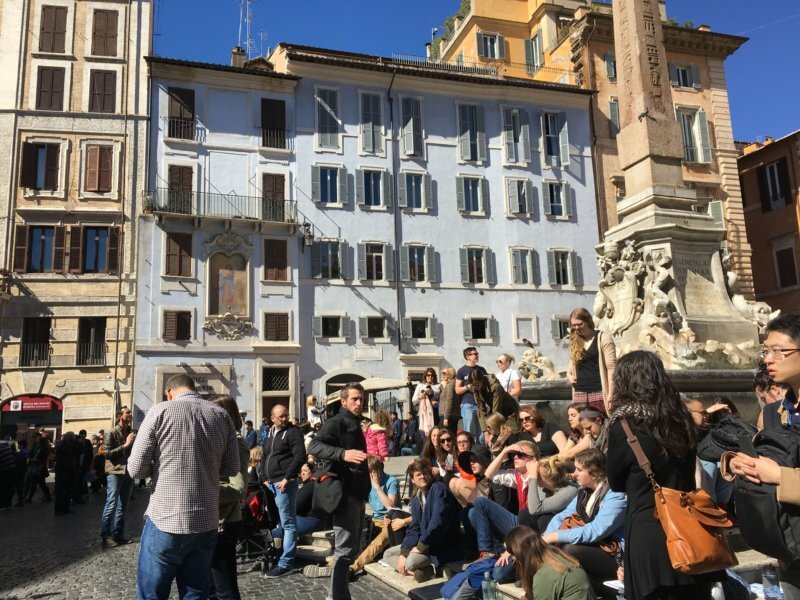 This is a pedestrian square where street artists sell their paintings and Roman families show up in their Sunday clothing. 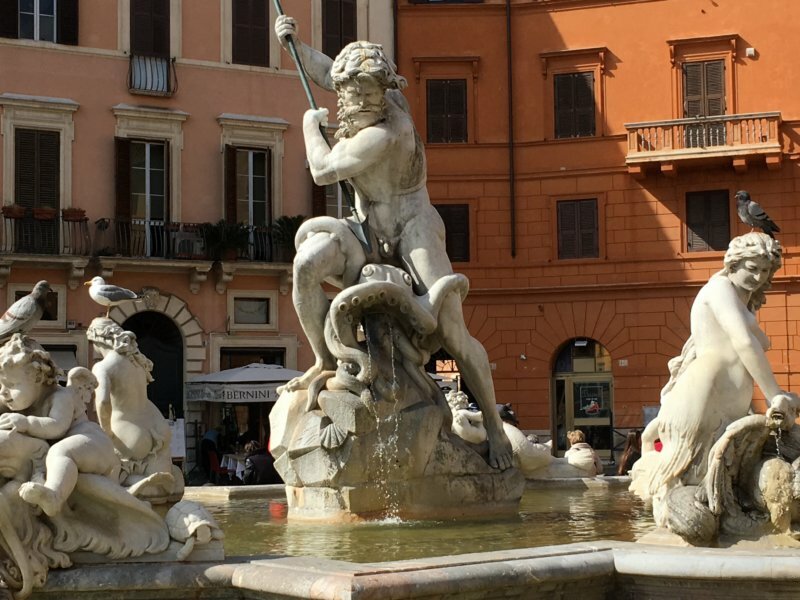 Piazza Navona is lined with Baroque palaces and street cafés. 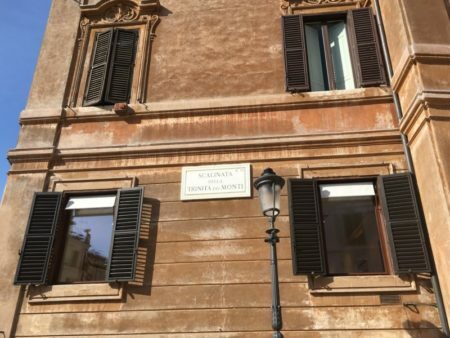 I would say this is the real center of Rome, if any. 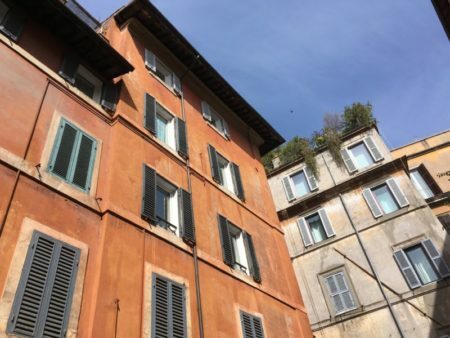 If you can book your hotel in the Centro Storico and you are close to everything. 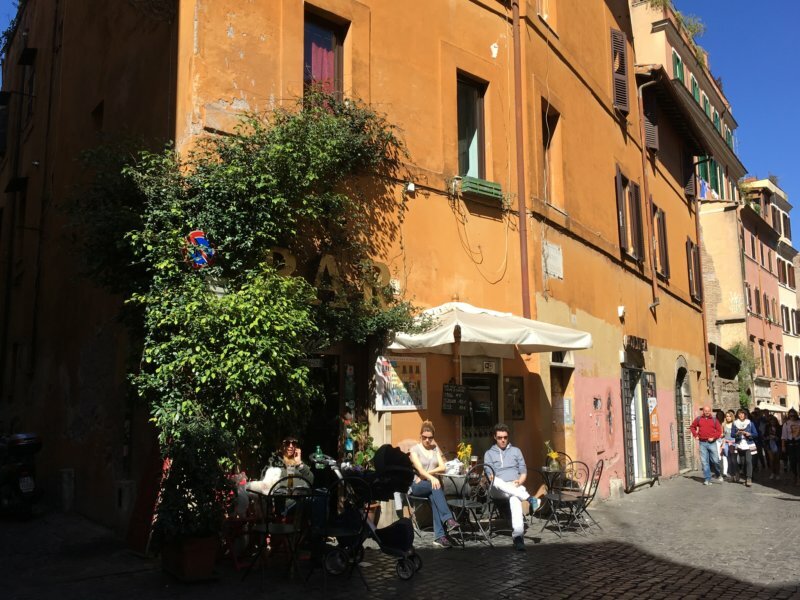 There is a good choice of hotels in the narrow alleys around Piazza Navona, most of them small family-run hotels or bed and breakfasts. If you stay here you can walk to all sights. 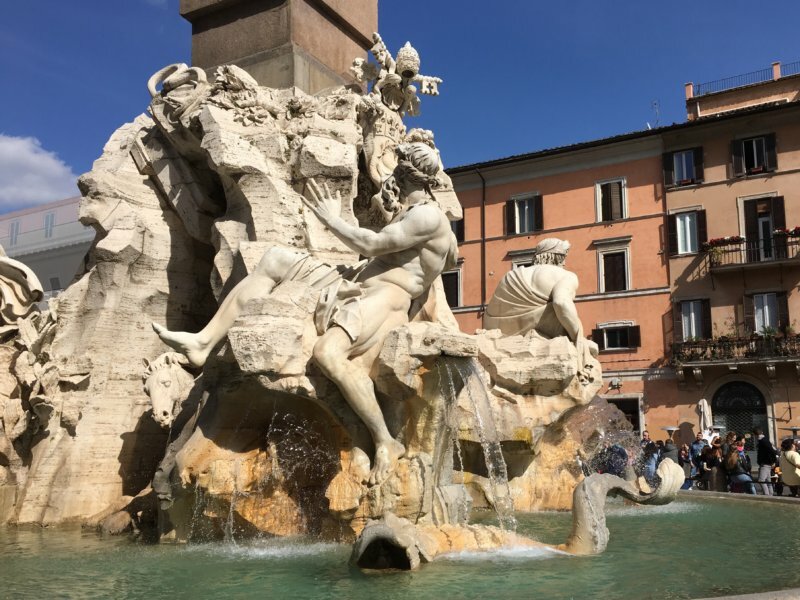 In addition to the Fontana di Nettuno Piazza Navona has one more fountain, the Fontana dei Quattro Fiumi, the Four Rivers Fountain. This fountain symbolizes the four major rivers of the four major continents: Danube, the Ganges, the Nile and the Rio de la Plata in the Americas. Again I have to sit down and watch a fountain. 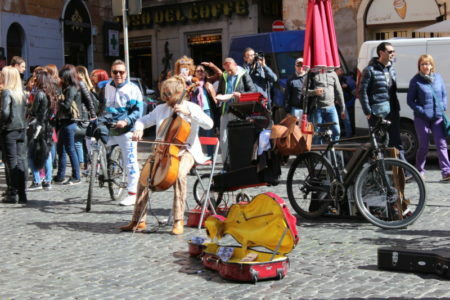 Spend some time in the streets around Piazza Navona and you’ll like it! 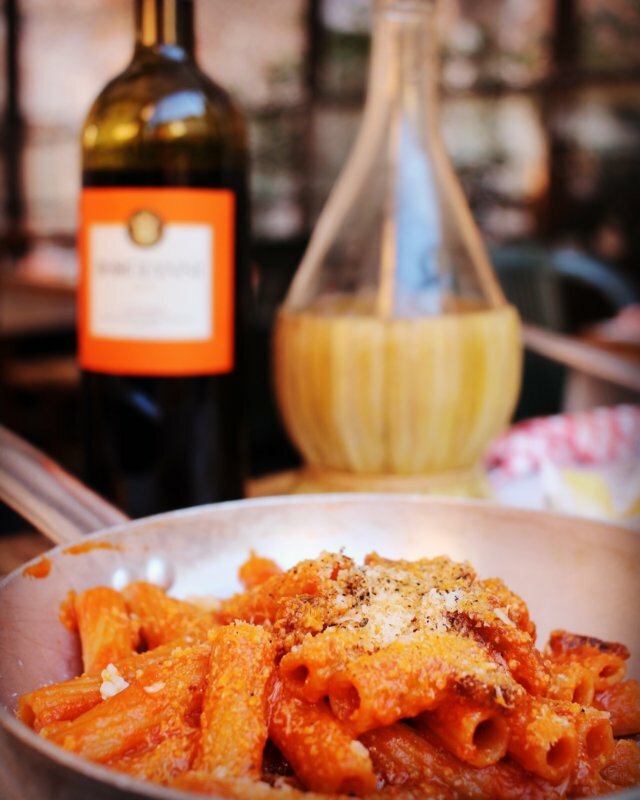 And maybe you want to have a lunch in a small Italian trattoria. 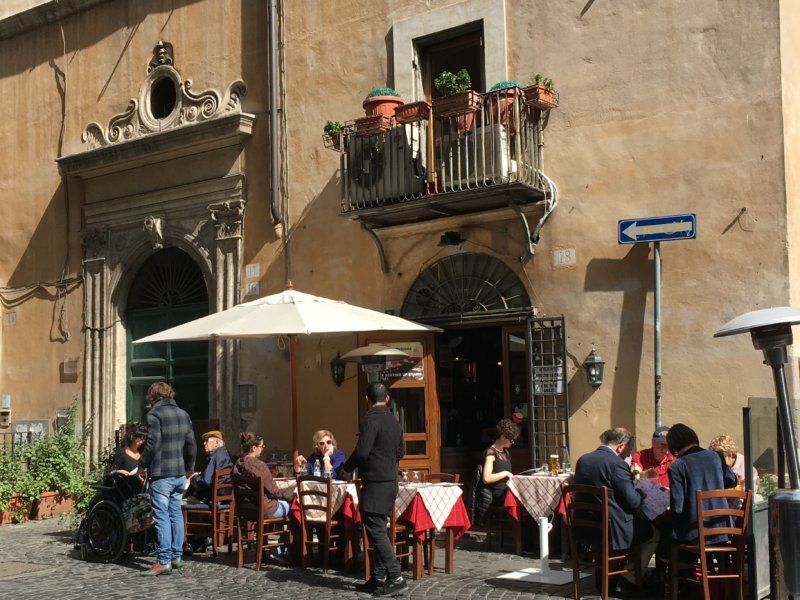 There are trattorias and fine restaurants all over in centro storico side streets. This is the place where Romans like to dine in the evenings. 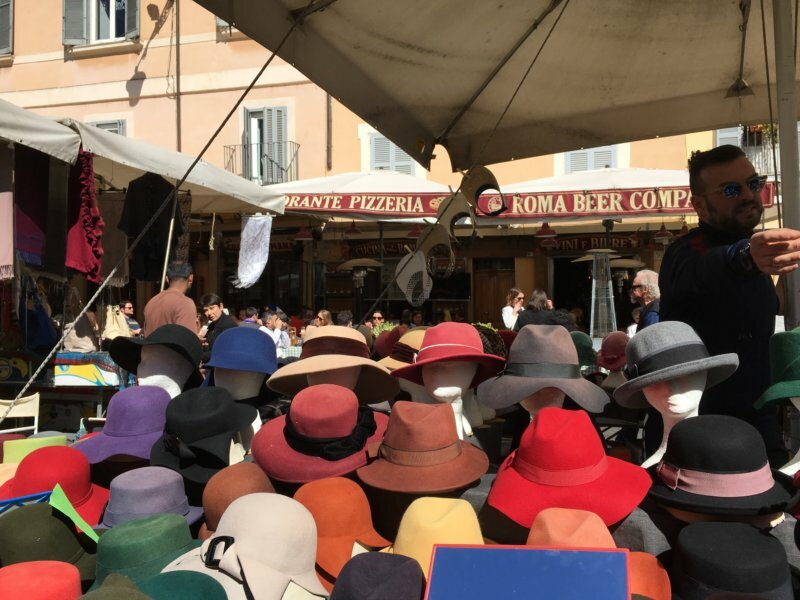 The third of my Top 10 sights in Rome is The Campo de’ Fiori, one of the 150 markets that exist in Rome and the most famous of them. 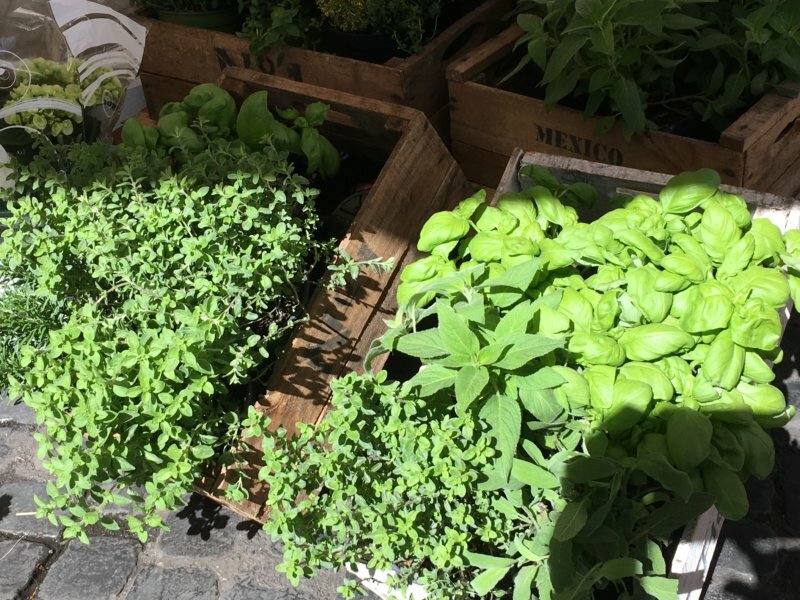 The Campo de’ Fiori is a flower, spice, vegetable, food and cloth market that in evenings becomes a center of nightlife. The “field of flowers” is really busy at market-time in the morning and then again after dark when it can get too crowded, not least on weekends. 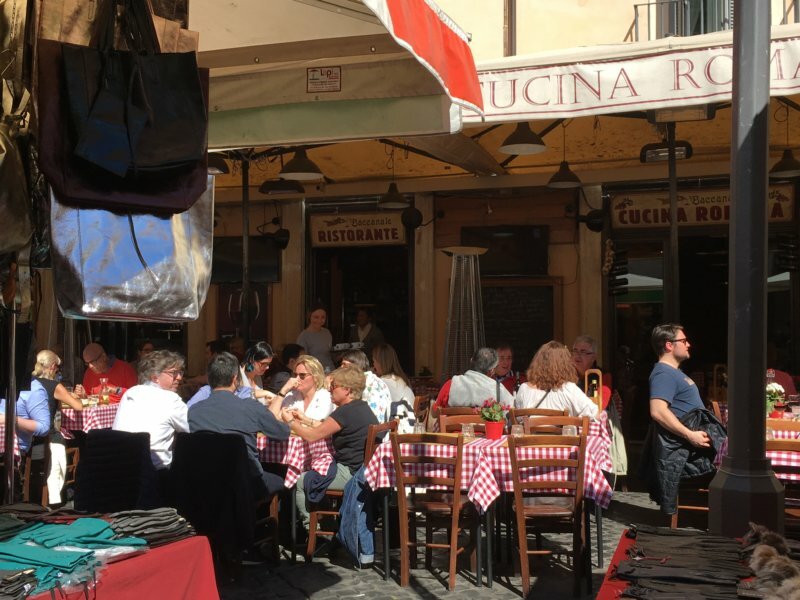 The whole Campo de’ Fiori area has good restaurants in every corner, catering for their guests. 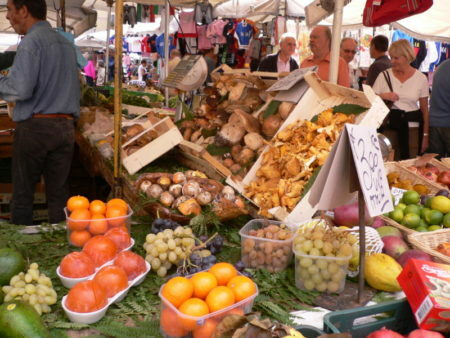 And the market of course is the best place for inn keepers to pick up fresh ingredients for cooking. 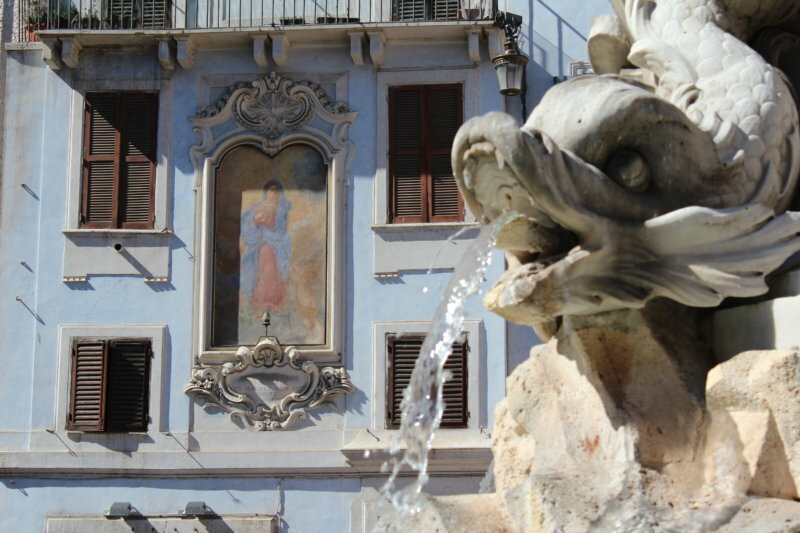 Like most Rome piazzas the Campo de’ Fiori has a fountain and a statue. 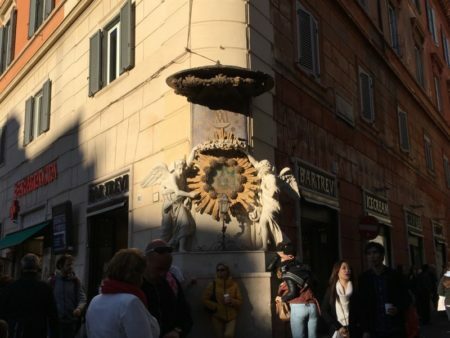 But the Campo de’ Fiori statue differs from all others: it is a reminder of the square’s grim past as the place in Rome where many Romans were executed. 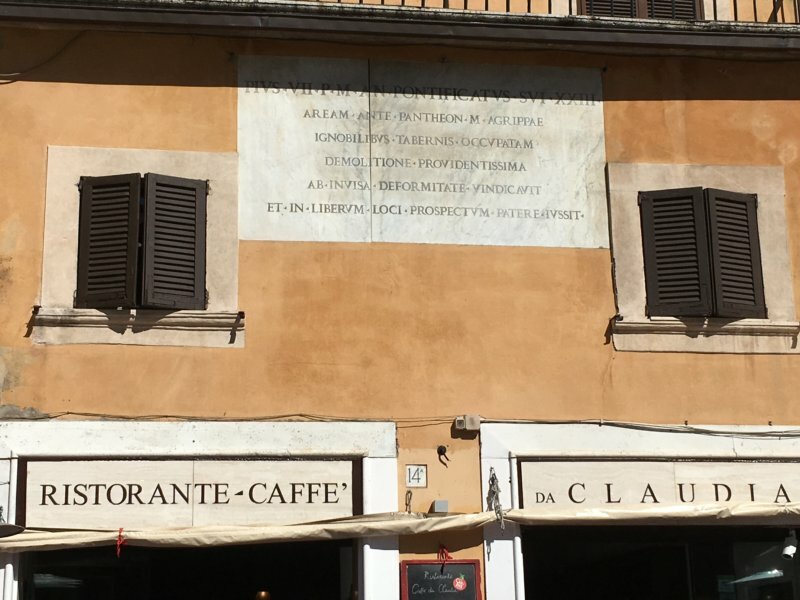 The statue shows a philosopher that also died on this square. 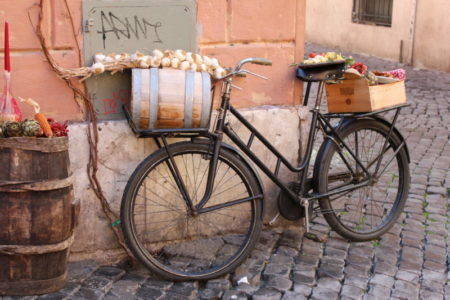 The Campo de’ Fiori area is also known for its good Italian food shops and narrow shopping streets. Via Giubbonari again is known for its affordable fashion shops. 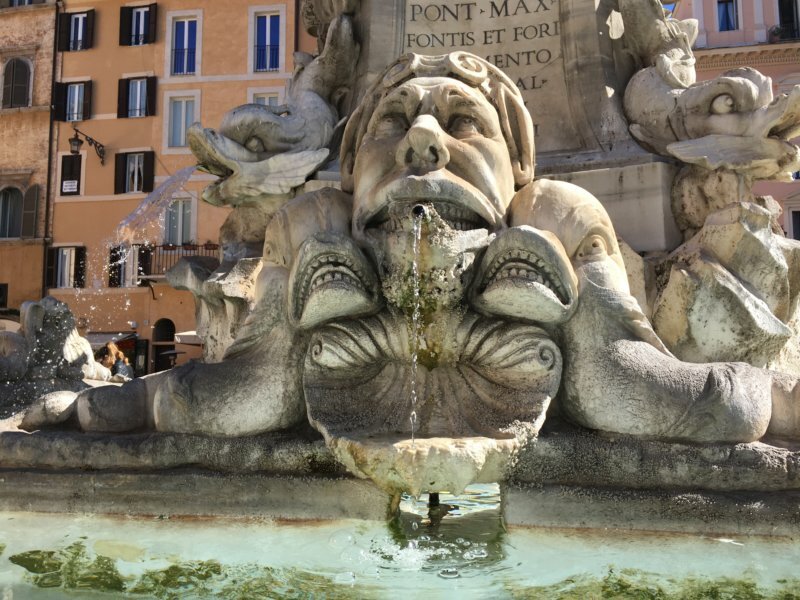 Via Giubbonari takes you from Campo de’ Fiori to another square further away, Piazza Mattei – with a turtle fountain! 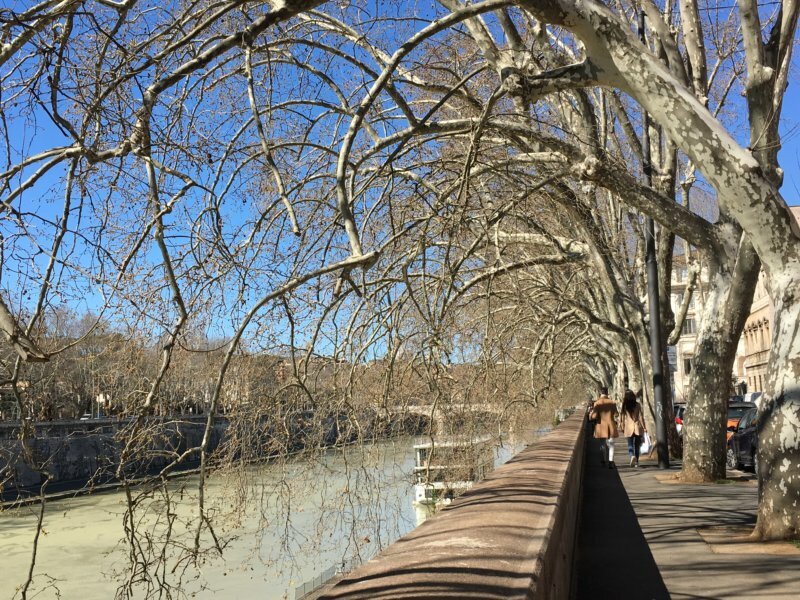 The River Tiber is the no 4 of our top 10 sights in Rome. 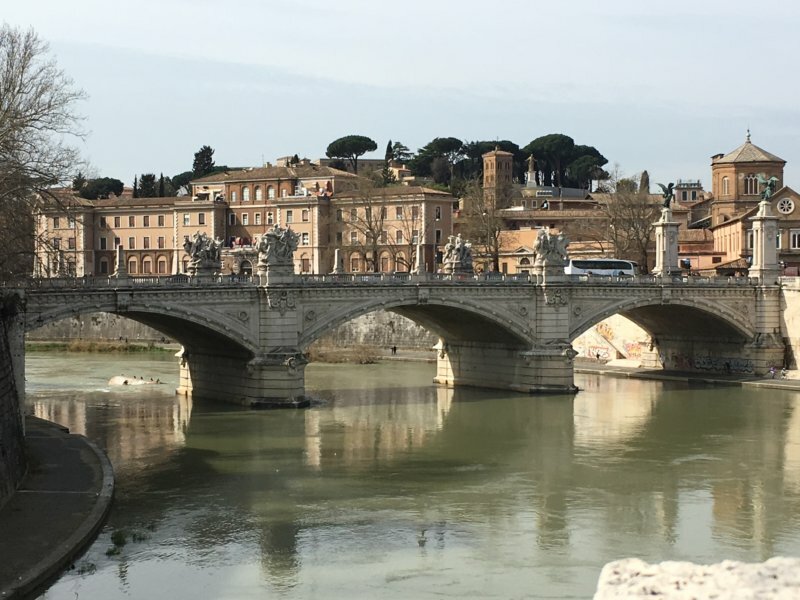 The Tiber has played a central role in Rome’s history. 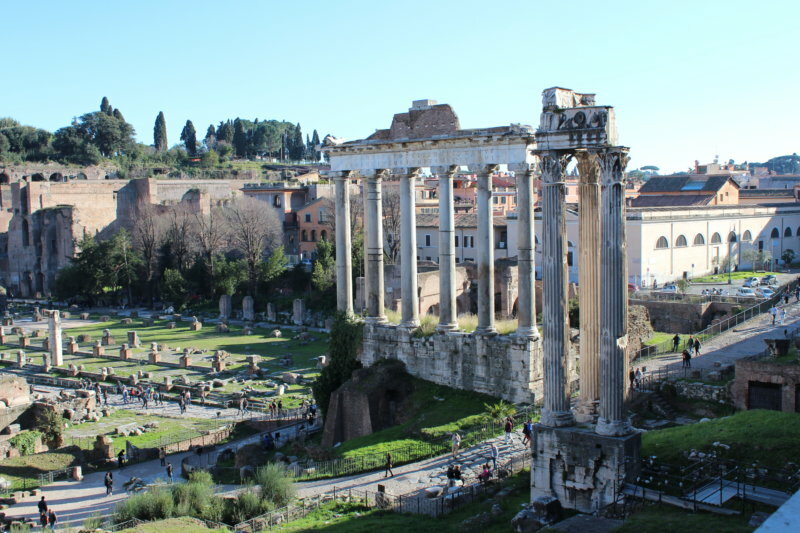 A legend says the city of Rome was founded by twin brothers Romulus and Remus. The mother of the baby brothers left them in the river and a female wolf rescued and raised them. 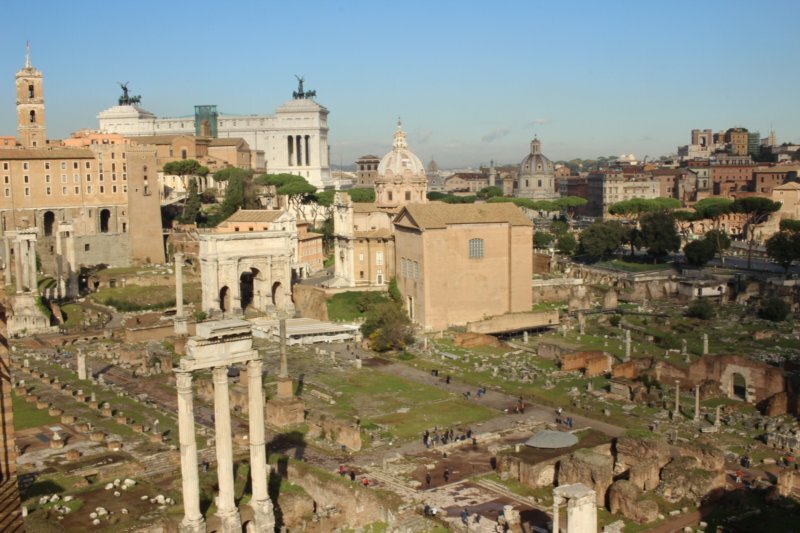 Also the Tiber has given Rome a chance to develop to what it became: the center of the Roman Empire. 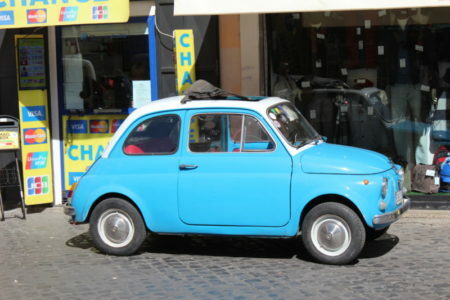 As one of the longest Italian rivers the Tiber has made a channel of transport. In Roman times waterways were the only way to travel and move cargo. 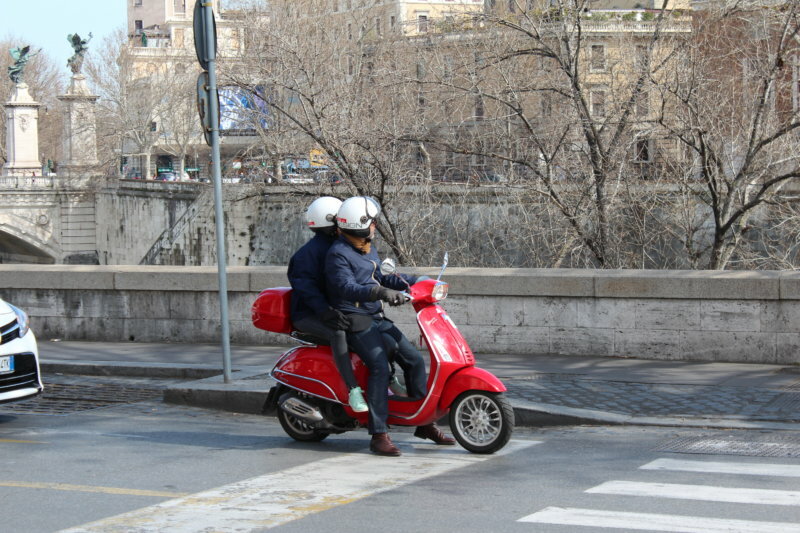 A Vespa and Ponte Umberto I. Behind the bridge Palazzo di Giustizia. 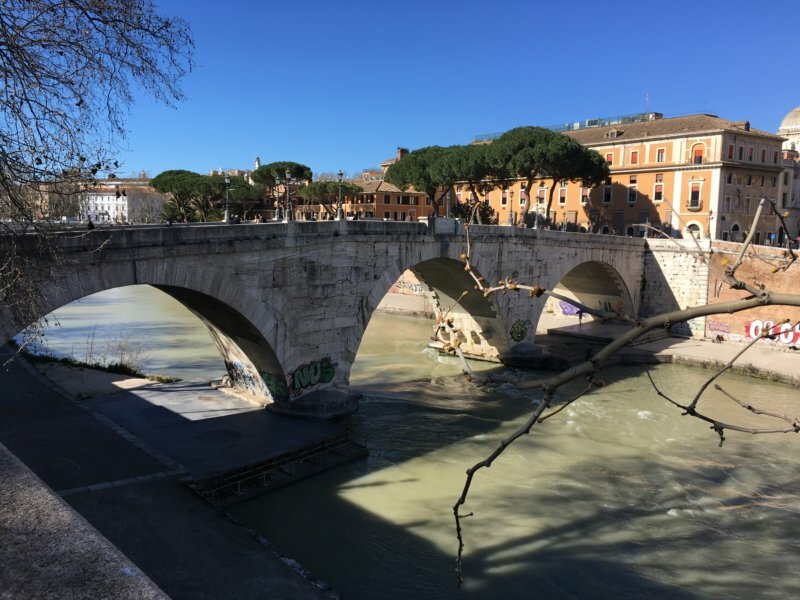 But the Tiber flooded a lot and caused problems until the Lungotevere embankments were built. Today you can safely drive and walk along these tree lined avenues on both sides of the river, without floods. 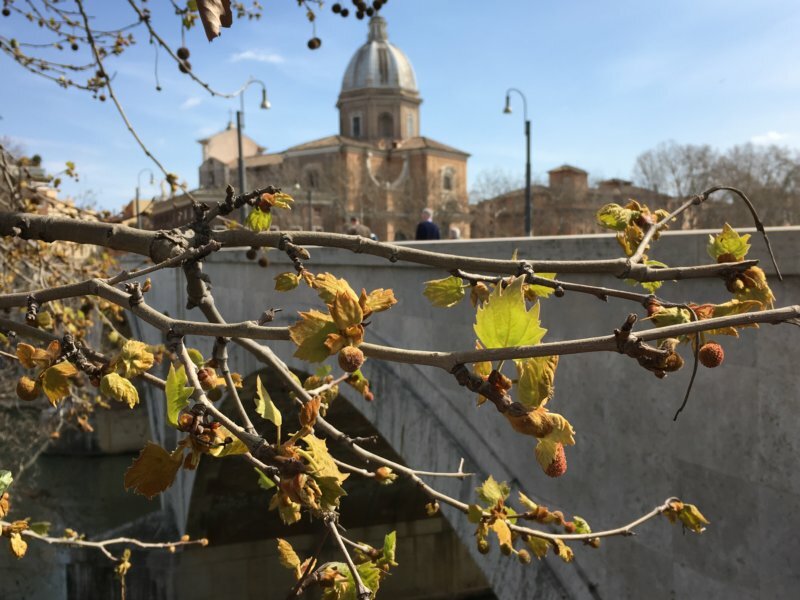 Tiber makes bends and the Centro Storico came up in its greatest bend. 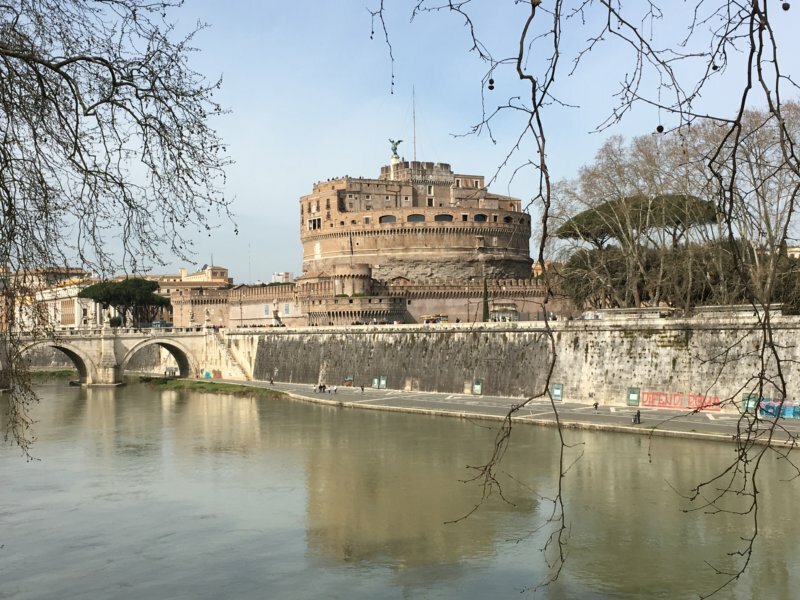 The ancient Rome is on the same side as the Centro Storico while beyond the Tiber grew some of Rome’s top attractions: the Vatican, Trastevere – and the Castel Sant’Angelo. 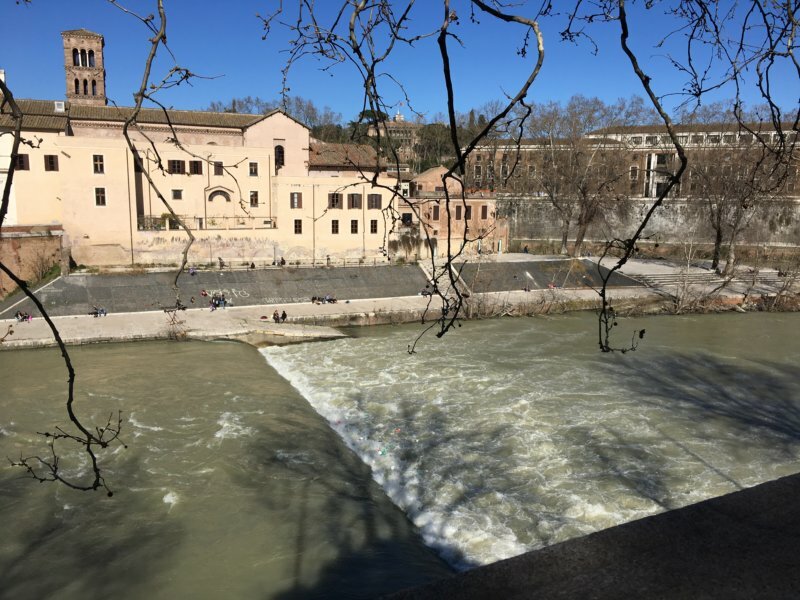 The Tiber has just one island. The Isola Tiberina off Trastevere is an island that looks like a boat and is linked to both shores by bridges. 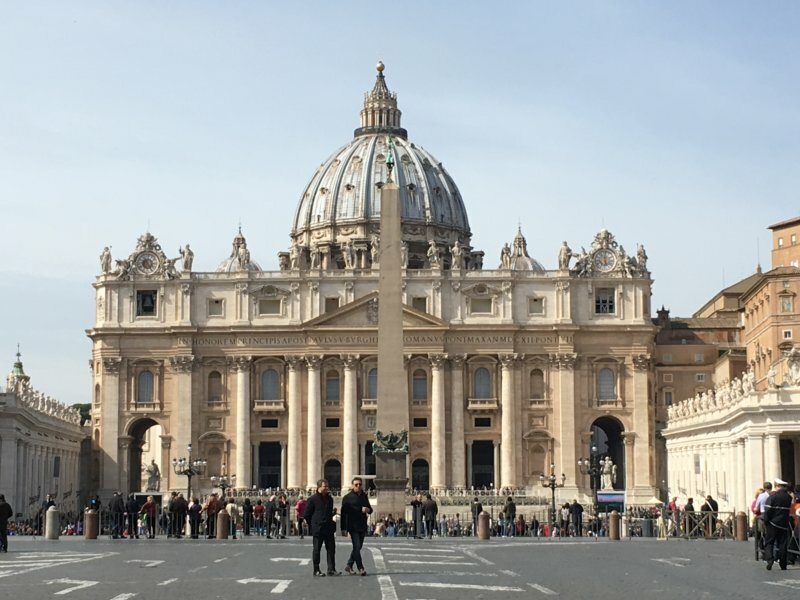 The Vatican is our Rome Top 10 sight no 5. It is an independent state and the capital of Christianity. The Pope and some 800 other citizens live in this tiny state that is the smallest in the world. The Vatican State has its own stamps, media and police and medieval walls protect its area. 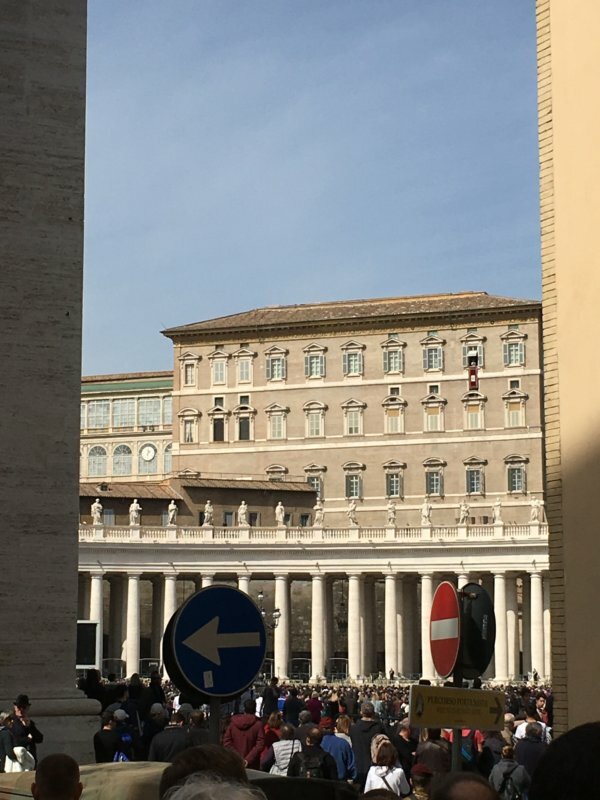 The center of the Vatican State is St Peter’s Basilica with two round wings with rows of columns on both sides, like arms protecting the citizens. 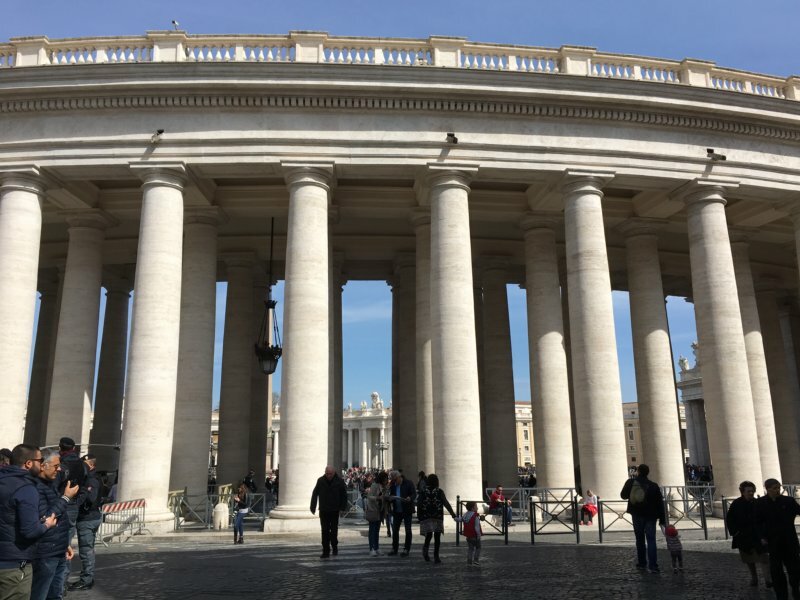 The Piazza San Pietro in front of St Peter’s is a key-shaped square which you can see it from the roof of the Basilica. There is symbolic in this too, St Peter has the keys to heaven. 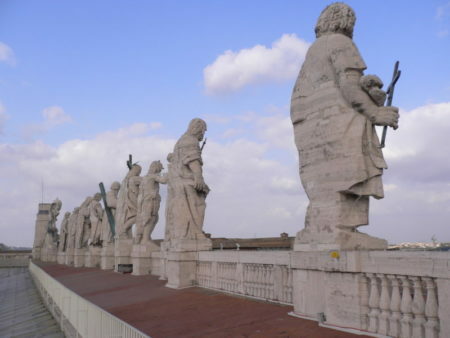 On the roof of St Peter’s Basilica are all the twelve apostles in a row, looking down and guarding the city. The wings have four columns in a row in all places, you can see them here. Try to stand in the middle of the square and you will only see one column in each row. 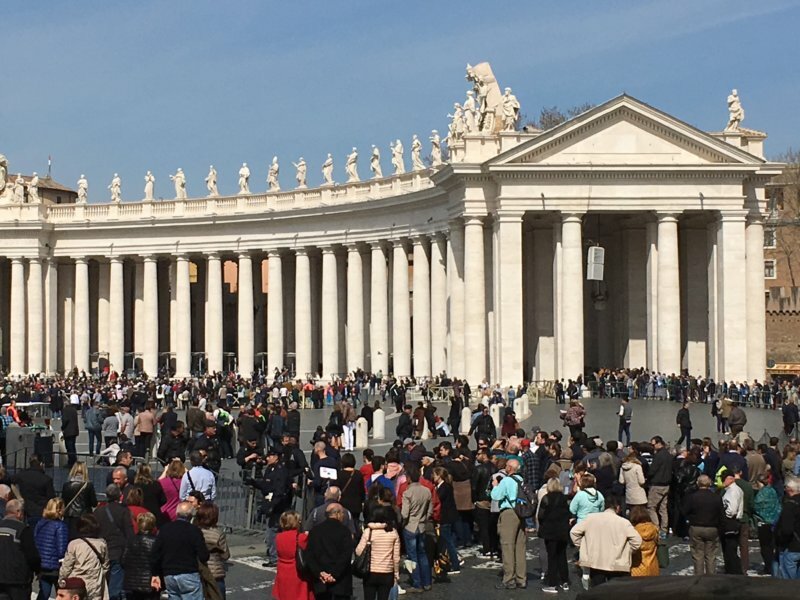 A highlight of the Rome weekend: at Sunday noon there’s always a big happening when Papa blesses the crowd. You don’t really see him on the photo but he is standing at library window, second window from the right, (see the highest floor). 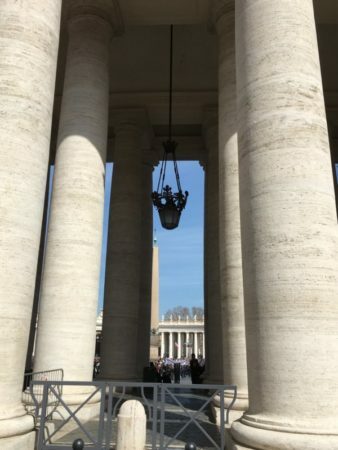 If you plan to go inside the Basilica like you should do, don’t try to do it a this time when everybody else is here. 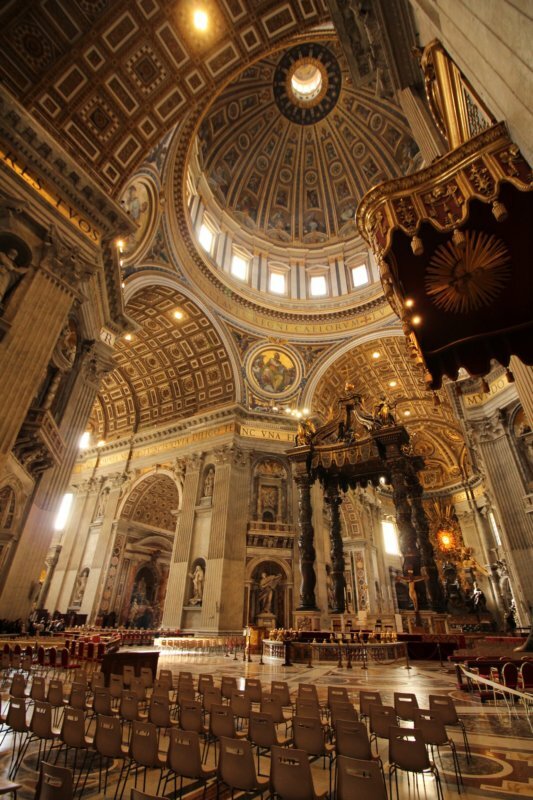 The St Peter’s Basilica dome is massive. The dome is the tallest coupole of the world. If you want to get up in the dome, take the elevator to the roof where the dome begins and then climb 330 stairs between the dome’s inner and outer wall. On the photo you can see us climb between two walls. 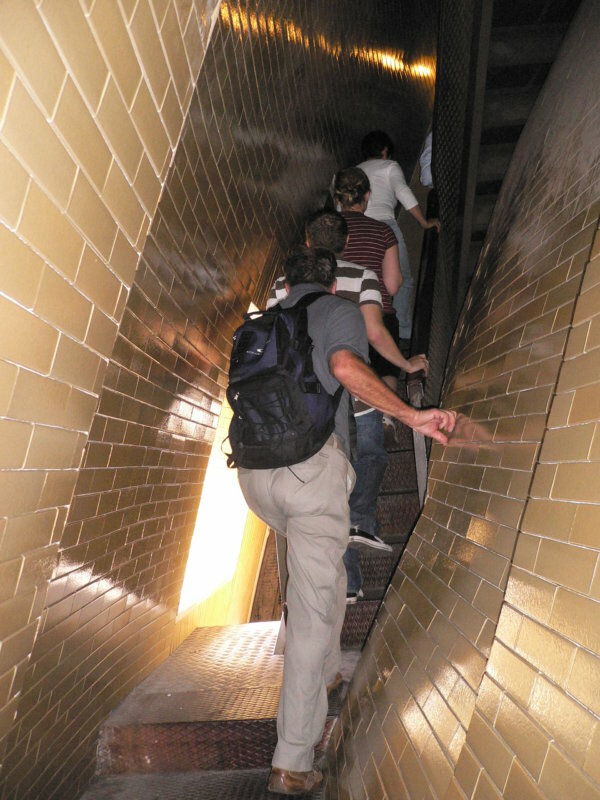 Going up is worth the effort, the views from the top are sensational and you can also see the Basilica interior from above. 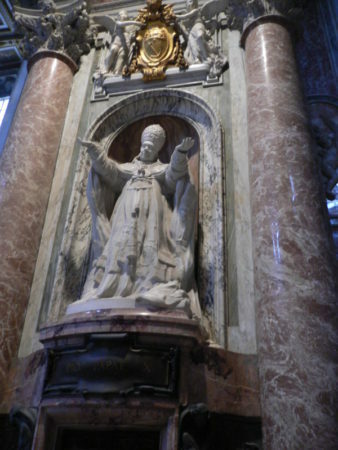 Michelangelo and Bernini really did a great job in decorating St Peter’s Basilica, but Michelangelo never saw his work completed, he died before his work was completed. 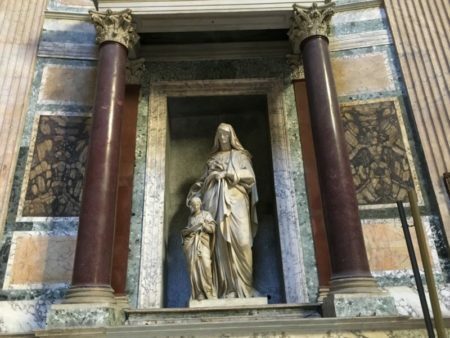 Michelangelo also worked in the Vatican Museum. His amazing paintings in the Sistine Chapel make the museum’s top attraction. The other top sight is the Raphael’s Rooms. 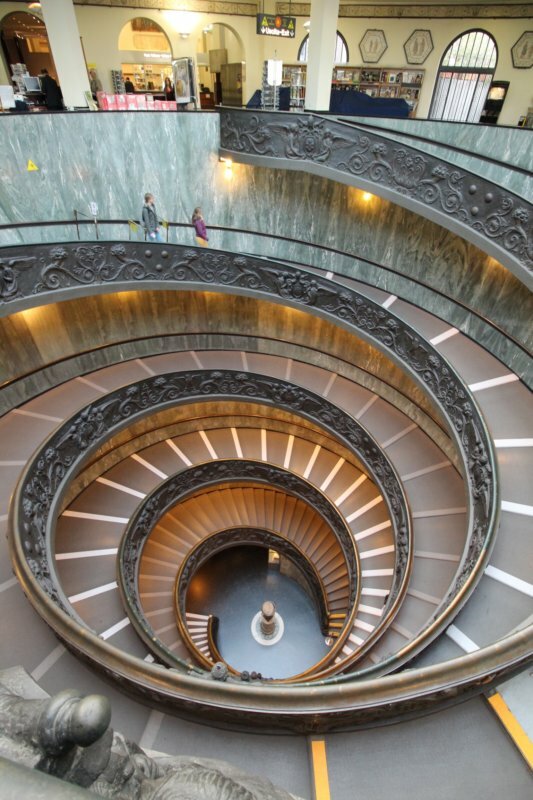 The Vatican Museum has kilometers of halls and corridors with precious art – and a spiral staircase, Giuseppe Momo’s ramp that brings you from the museum back to the street after visiting. 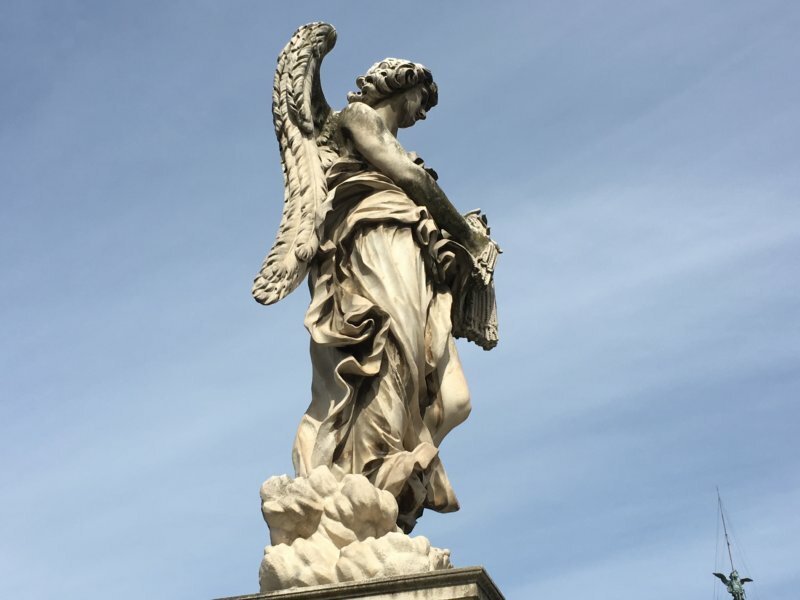 The Vatican Museum is a must see in Rome, provided you stay longer than a weekend. To avoid the queues (hundreds of meters) buy tickets on their website. 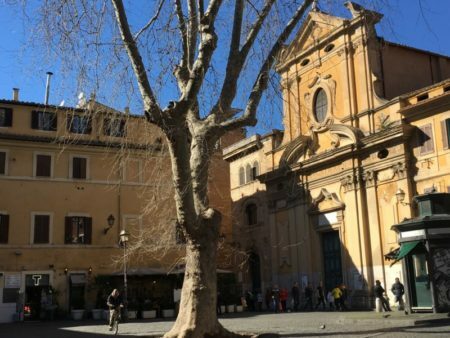 Trastevere, “across the Tiber”, appeared in the next bend of the River Tiber but on the other side. It became the area of outsiders, an isolated neighborhood that created its own traditions and way of life. 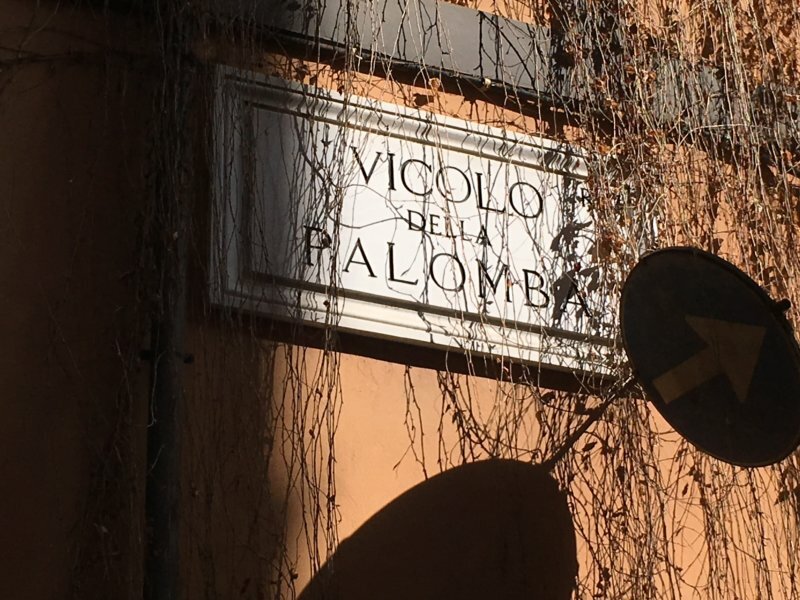 Even speech is different in Trastevere. But this working-class was so pretty that it became a place where people came in the evenings: to dine, to stroll or just to have a drink in one of the cafés that appeared on pavements after dark. 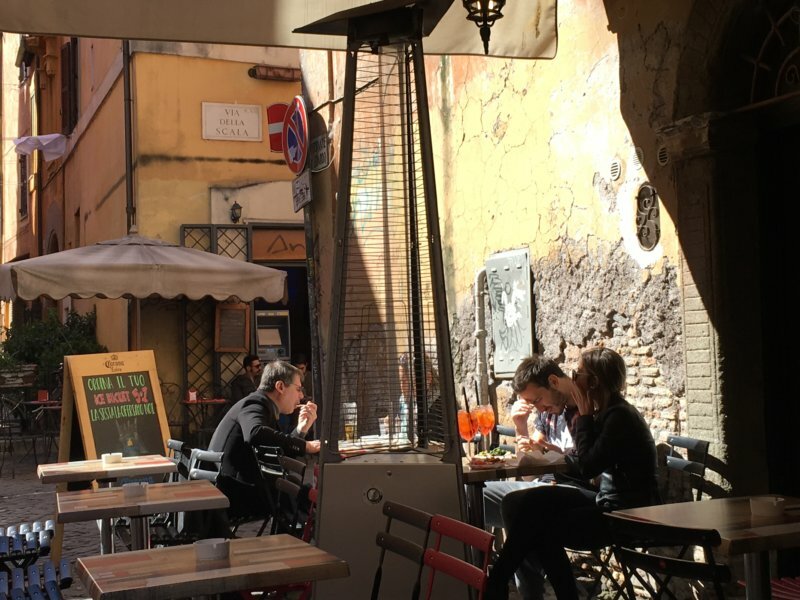 By day it’s quiet here which makes daytime a perfect time to enjoy the narrow alleyways – and the spring in Rome! Despite all the vespas Trastevere is medieval and pretty which makes it a perfect place for an Italian dinner. 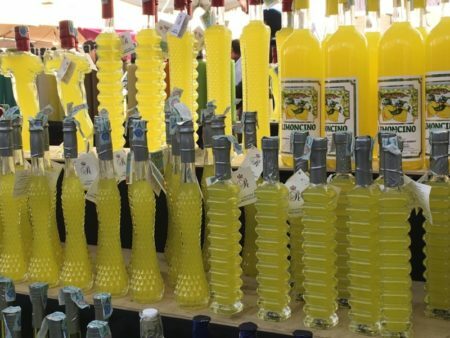 Meravigliosa! 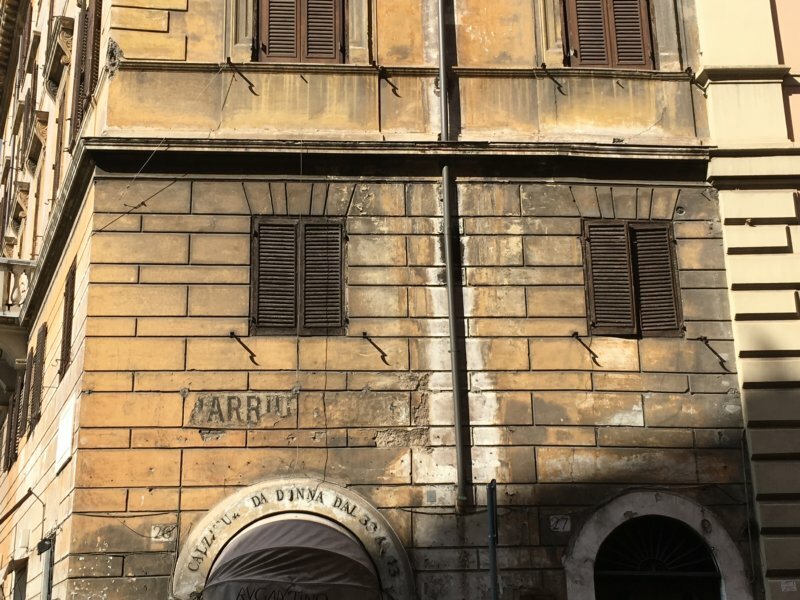 After the medieval Trastevere and Centro Storico it’s time to see an older layer in Rome’s long history. Two more Top 10 sights in Rome: Capitoline Hill and Ancient Rome. 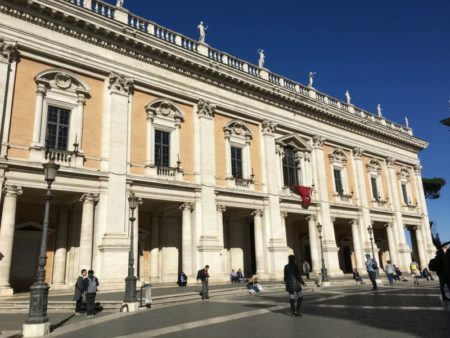 This place, the Capitoline Hill has been the political power center of the whole world. 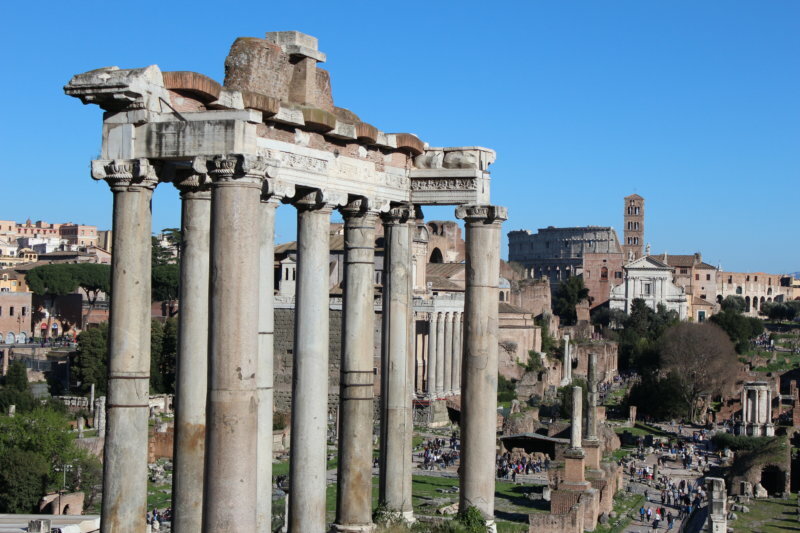 They ruled the Roman Empire from the Capitoline Hill and the other important parts of ancient Rome were at nearby: the Roman Forum, the Imperial Fora and the Palatine Hill. 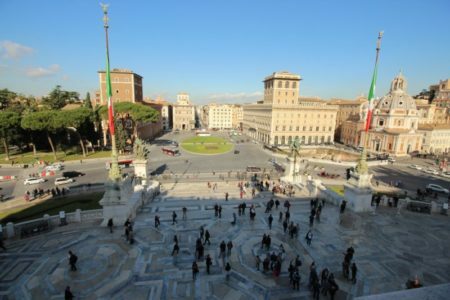 From the Capitoline Hill you can still today get the best views to the most central remains of Imperial Rome. So why not start exploring ancient Rome on this hill. The hill itself doesn’t have any ancient Roman buildings left, Renaissance palaces by Michelangelo once replaced them. The palaces contain the oldest museum of the world, the Museo Capitolini with a huge collection of sculptures and paintings on Roman history. 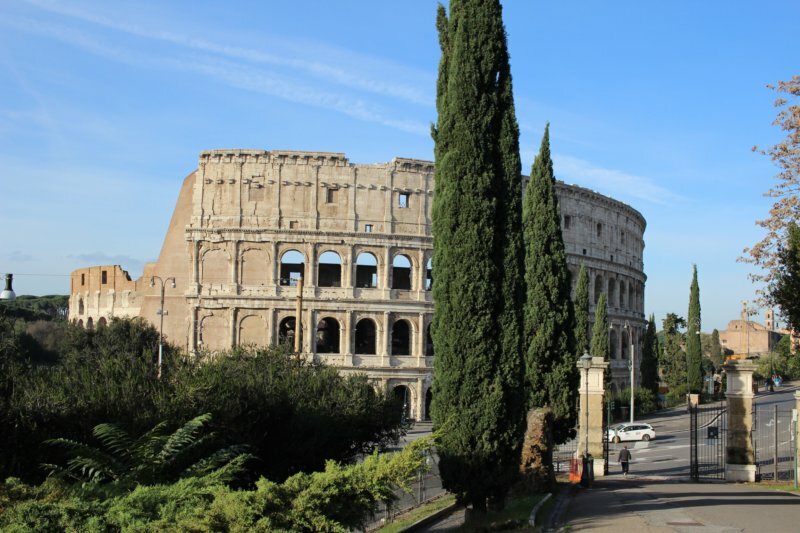 The top attractions are the original she-wolf statue with Romulus and Remus and and the statue of Marcus Aurelius. 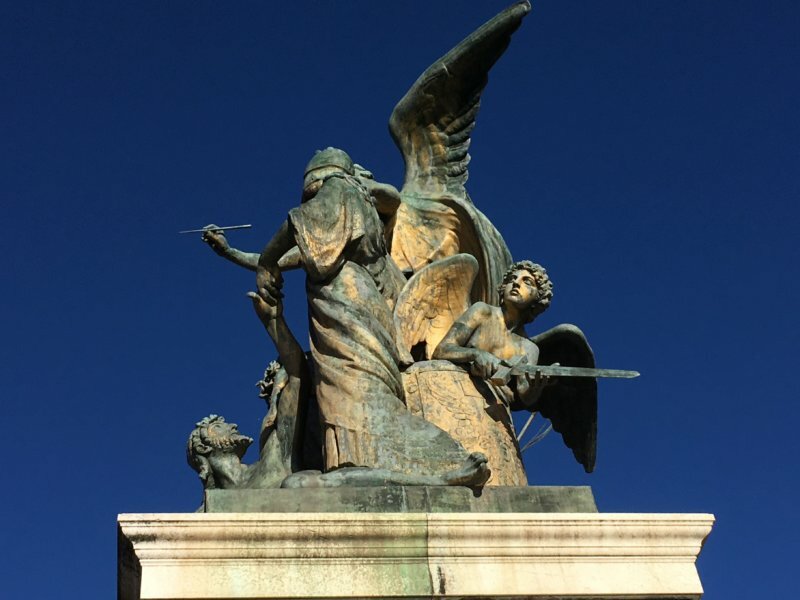 The pretty geometric square, too, is Michelangelo’s and the walking ramp to Capitol Hill is topped by the twin Gods, Castor and Pollux (a man and a horse). There are more stairs to the hill though, the Aracoeli Staircase. 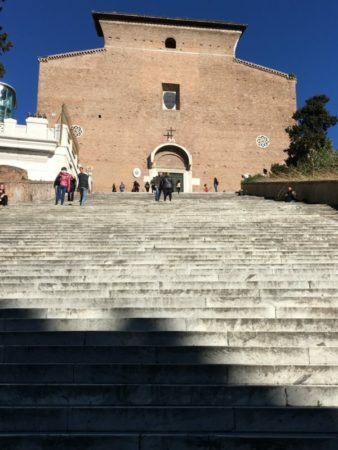 124 marble steps take you up to the church of Santa Maria in Aracoeli. 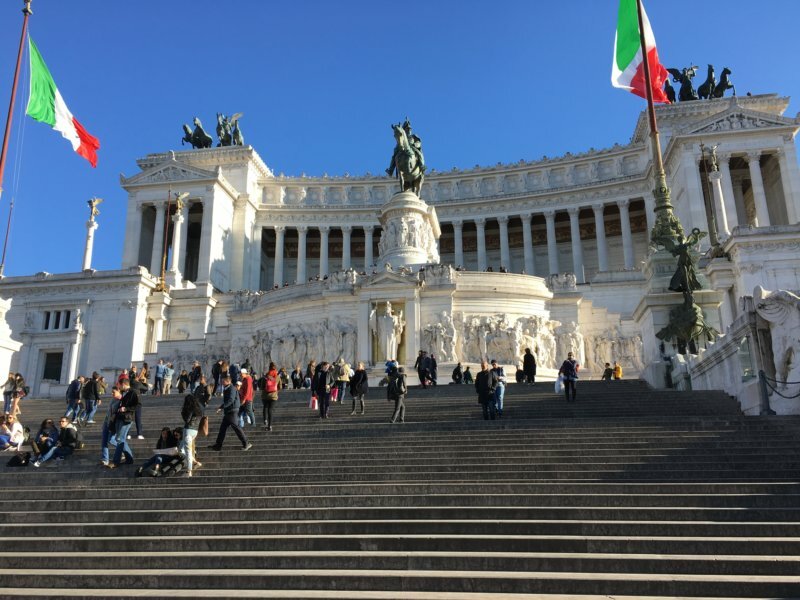 And – the third staircase to Capitoline Hill is below the Victor Emmanuel Monument (Il Vittoriano). 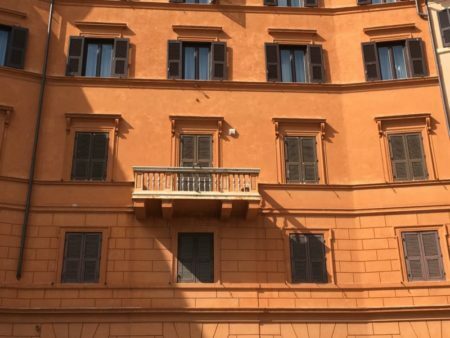 Il Vittoriano looks so different from everything else in Rome that most Romans don’t like it. They call it a wedding cake. 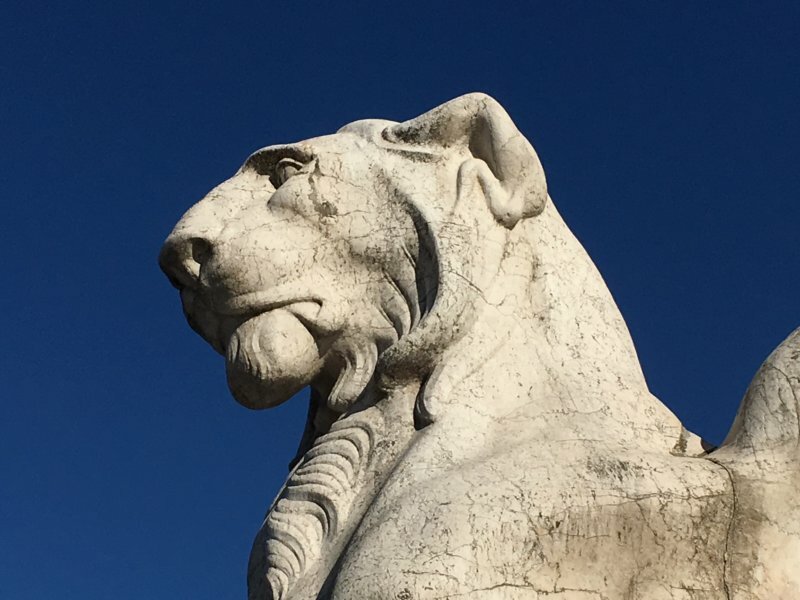 Building the Victor Emmanuel Monument for Italy’s first king meant tearing down medieval streets. 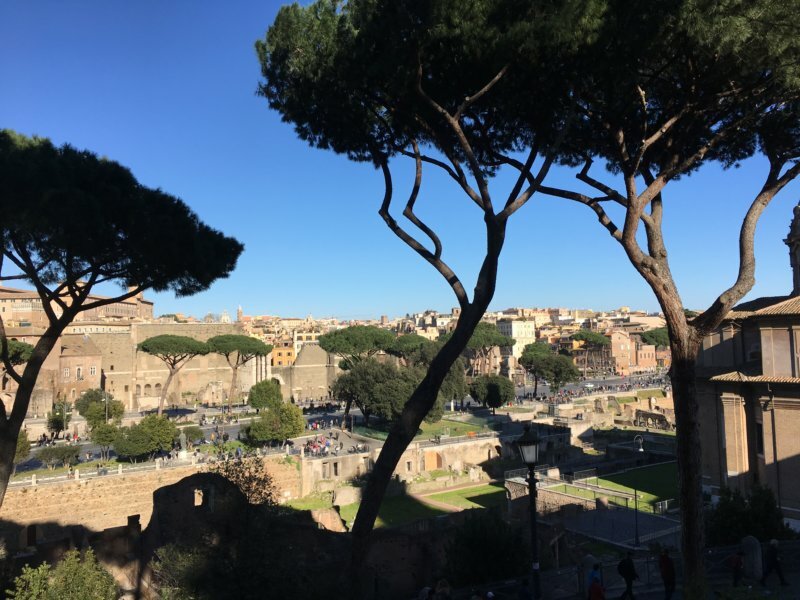 Walk down from the Capitoline Hill and you will have in front of you the absolute highlights of Ancient Rome: the Roman Forum, the Palatine Hill and the Colosseum. 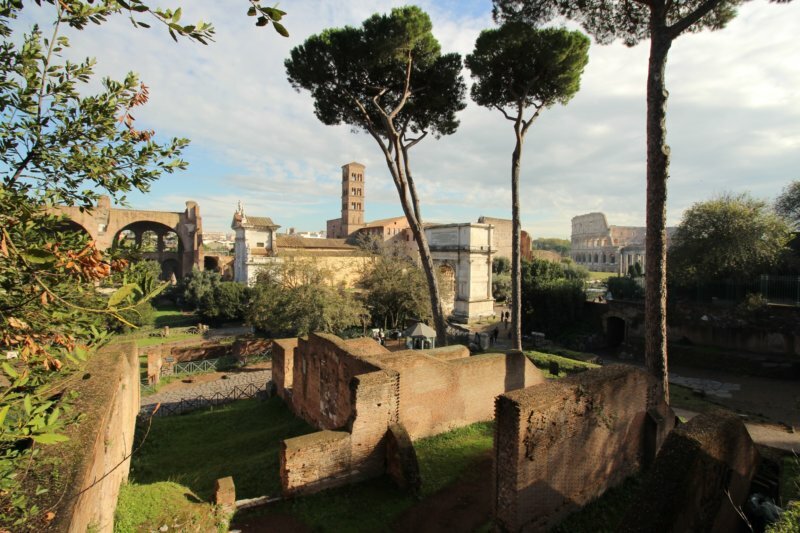 Palatine Hill is the oldest of the three. Iron age caves and huts still exist on the hill and it’s said Romulus and Remus were raised in one of the caves. After them came the rulers and the wealthy of the Roman Empire. They built their houses on this lovely hill with pines and meadow flowers. 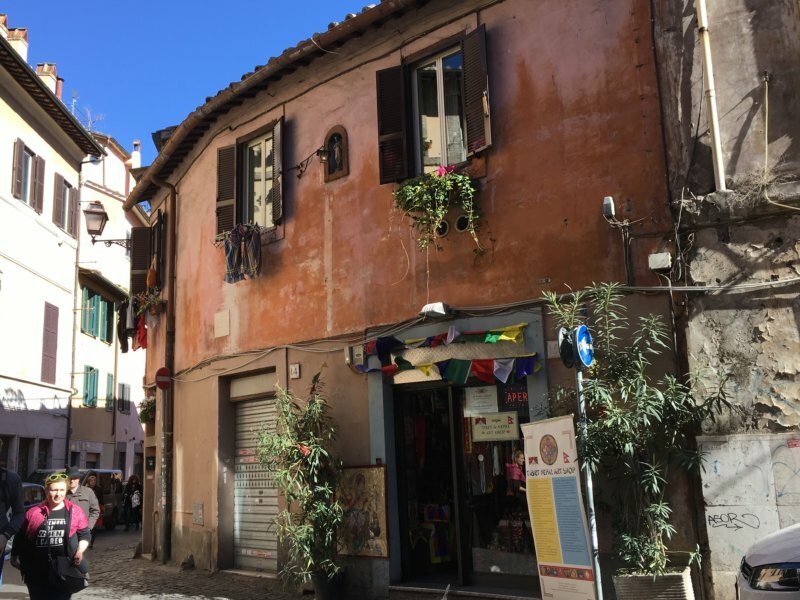 Some of these houses still remain, like the well-preserved palaces of the Emperor Augustus and his wife Livia. 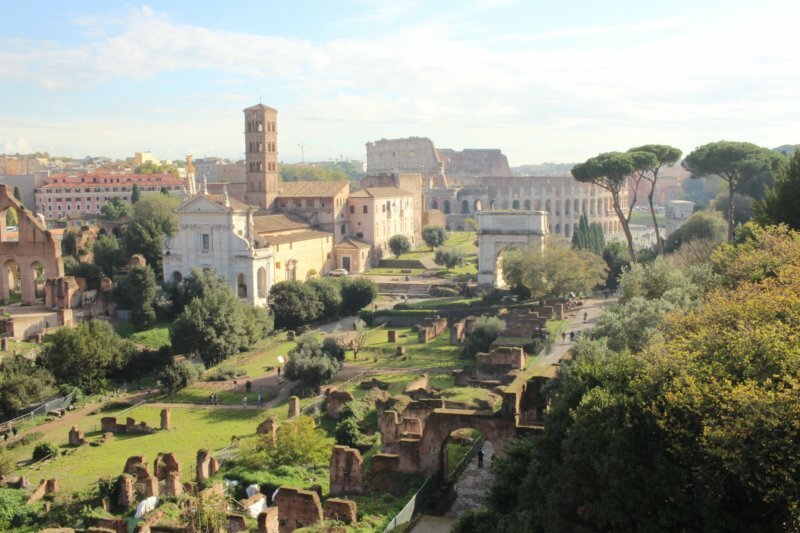 The Roman Forum in front of the Palatine Hill was a marshy area but in the 6th century they drained the the marsh and built a whole row of temples and palaces in the valley. 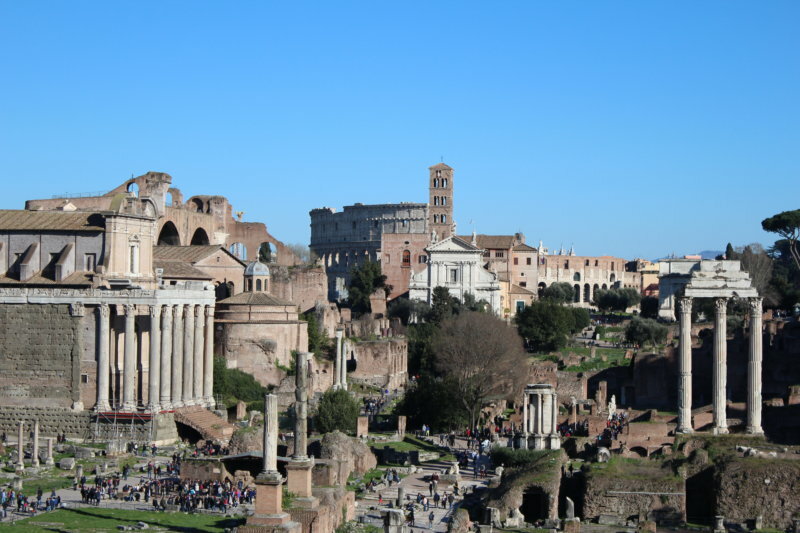 This photo shows the Roman Forum and the Colosseum seen from the Palatine Hill. 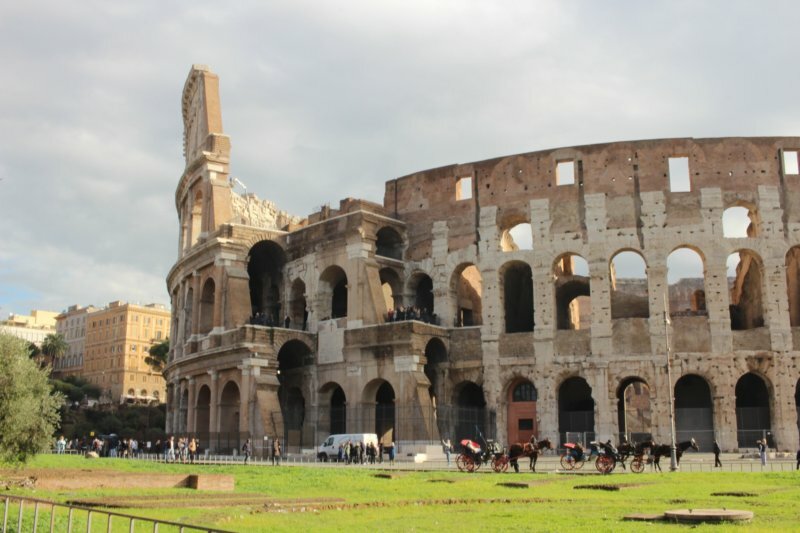 The Colosseum is so well preserved, you wouldn’t imagine it has stood in this place since 80 AD. 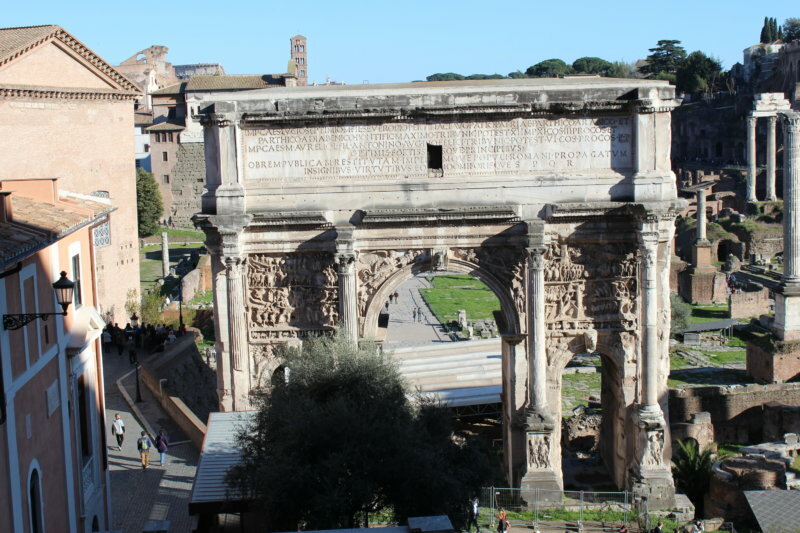 In that year they opened the 80 arched entrances for the first time, to let the 55.000 spectators in. What did they all come here for? They wanted to see gladiators fight each other to death and they also wanted to see wild African animals attack humans. Gladiators that fought here were criminals and slaves that were sentenced to death. They and the African animals waited for their turn in underground rooms below the arena. You can see their cells on this photo, there is no floor left. The Colosseum is not the only amphitheatre of its kind. There is another one in Verona, two in France and one in North Africa. 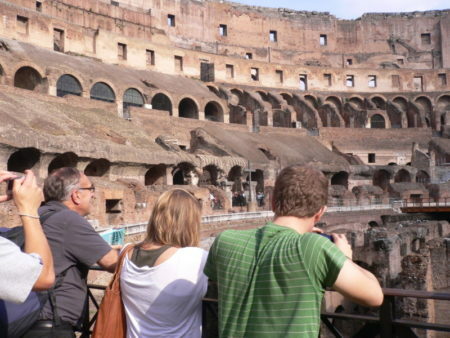 And the Roman heritage lives on, not as gladiator fights but as football stadiums all over the world. They all took the Colosseum model. 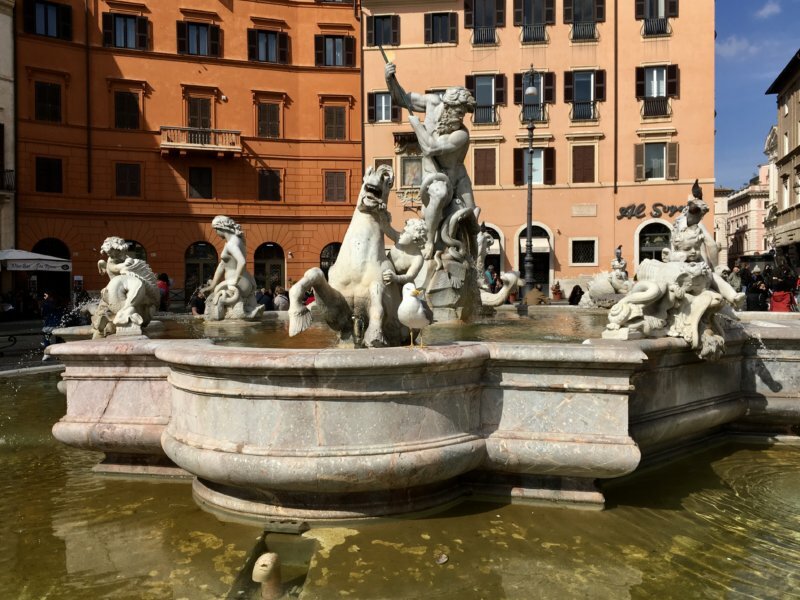 From Colosseum walk on towards the Spanish Steps and you will come to the Fontana di Trevi, the Trevi Fountain, our Rome top sight number 9. 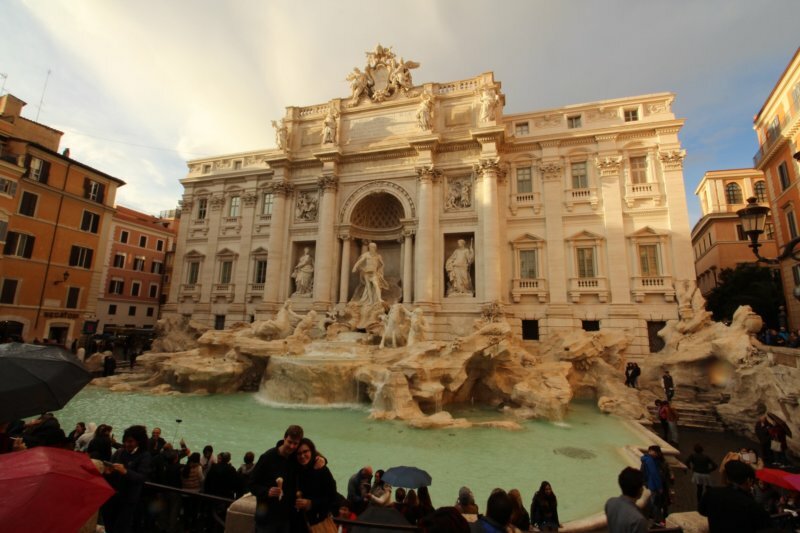 The Trevi Fountain is in the heart of Rome’s busy shopping district. And like the photos tell this really is a busy place. 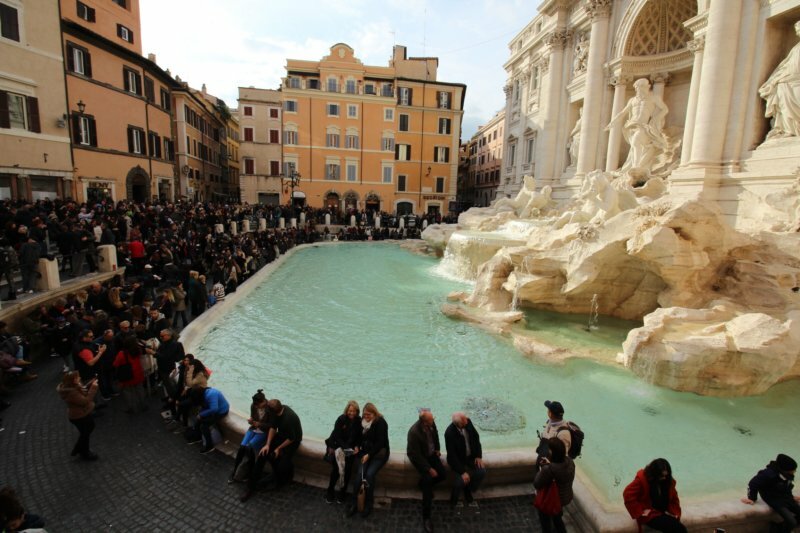 The square around the Fontana di Trevi is packed with people, always. And what about the fountain: you can see it here. 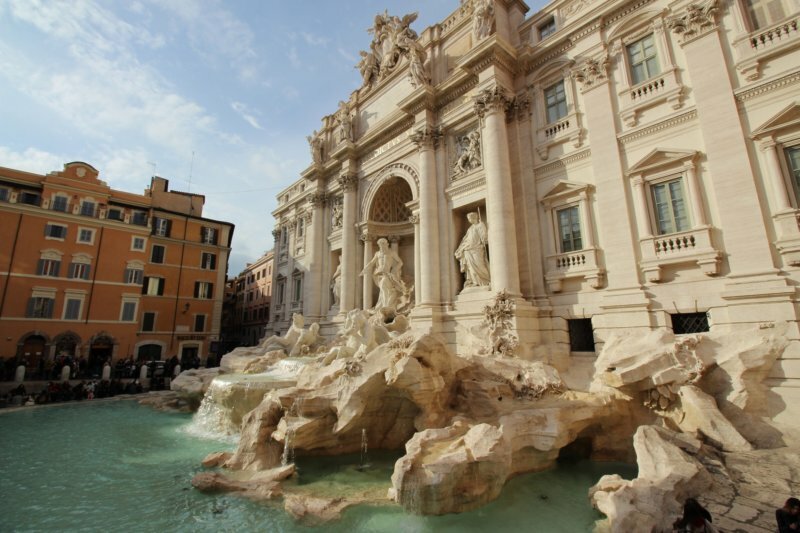 Fontana di Trevi gets its water from an aqueduct that has been in use since 1762 when the Romans built the fountain for Pope Clement XII. 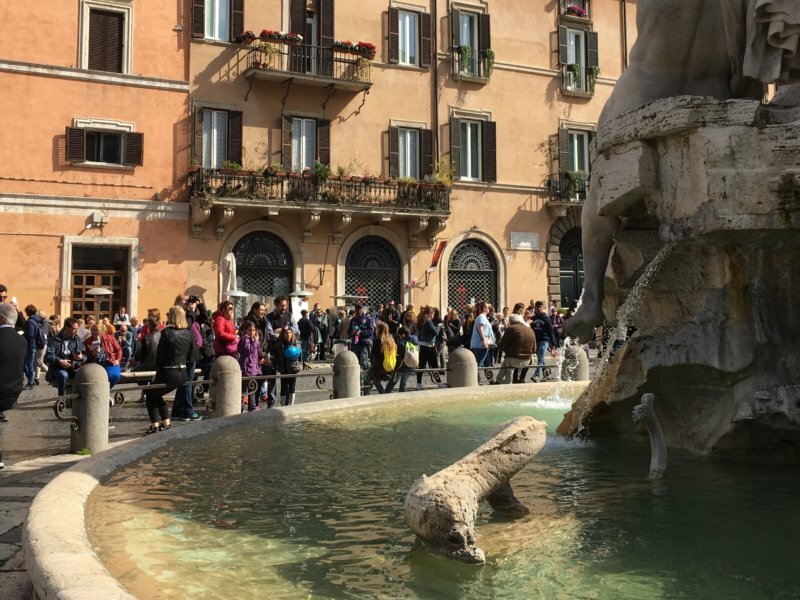 All these people come here to throw coins in the water over their shoulder – to make sure to return to Rome one day. 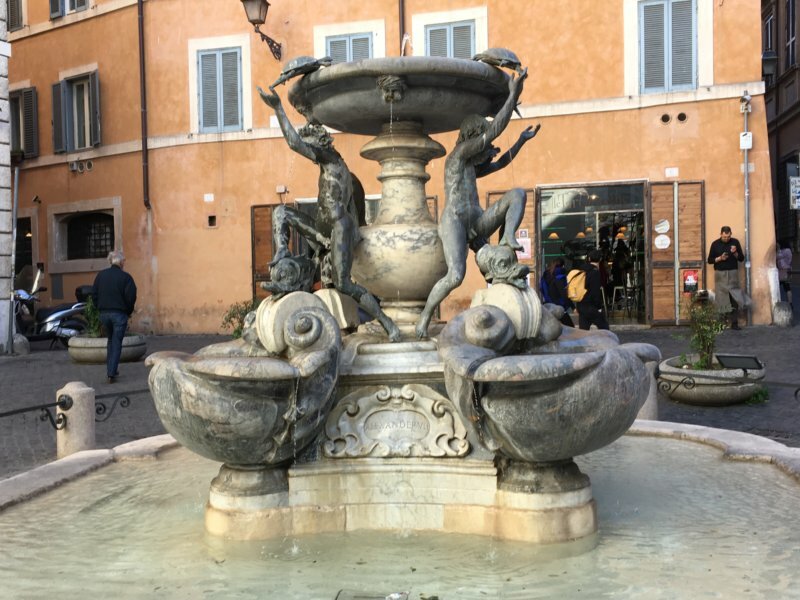 Originally the habit was to drink fountain water for good luck but times change, even in Rome. 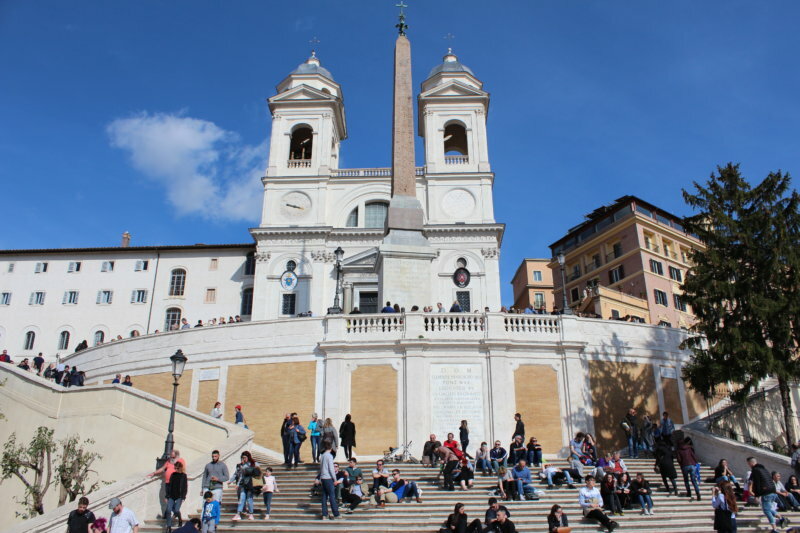 The last of my Top 10 sights in Rome is the Piazza di Spagna and its Spanish steps. What does the name come from, shouldn’t it be Italian steps? – This is an embassy area that got its name to honor the Spanish Embassy next door. The steps link the Church of Trinità dei Monti at the top with the Piazza di Spagna lower down. 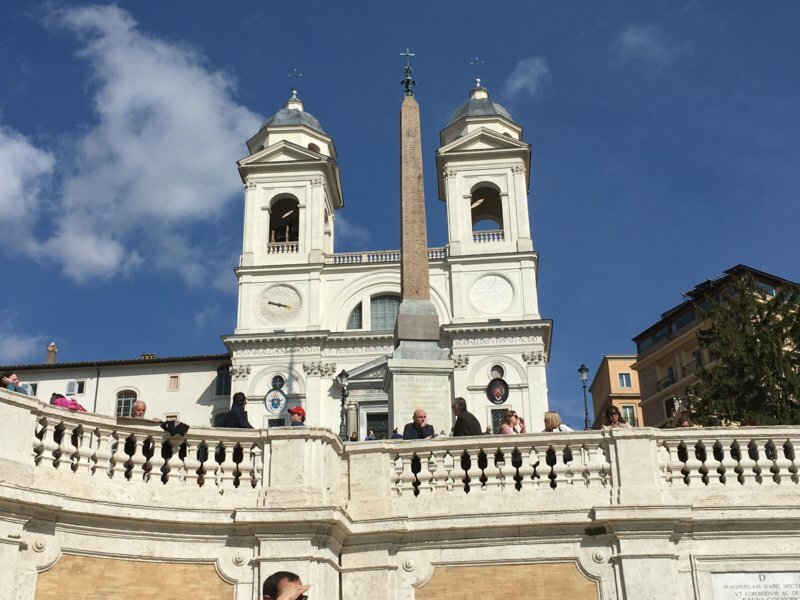 Like the Fontana di Trevi, the Spanish Steps top the list of Rome’s favorite sights, at least it attracts crowds of tourists. Visitors from all over the world flock here and sit on the Baroque steps and they come here all year round. 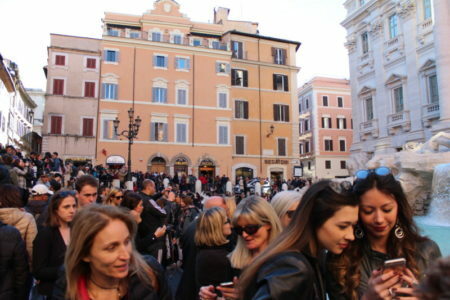 This is the Tourist Rome in its real meaning. But the steps and the square below are a meeting place for locals as well. 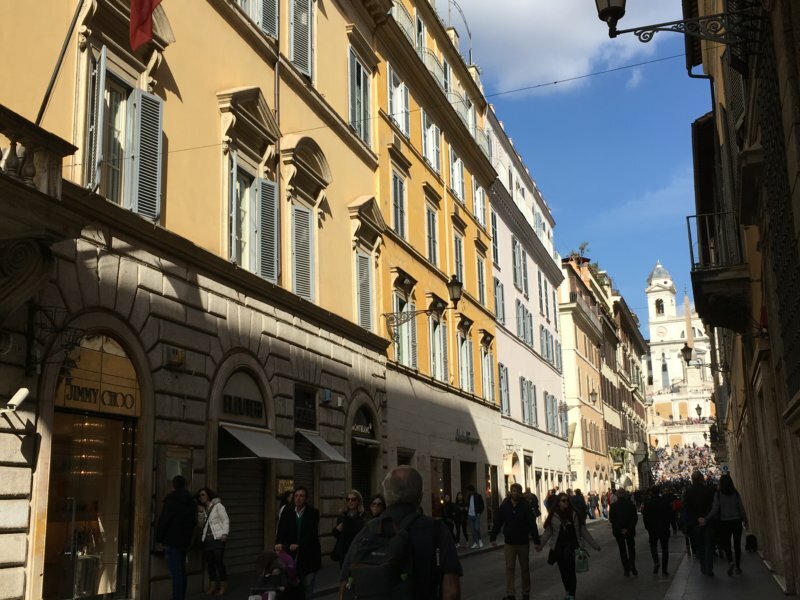 At the bottom of the stairs begins Rome’s most elegant shopping street Via dei Condotti with smart shops that sell exclusive products. The Eternal City is an elegant city: in addition to everything else Rome has one of the most elegant shopping areas in the world. 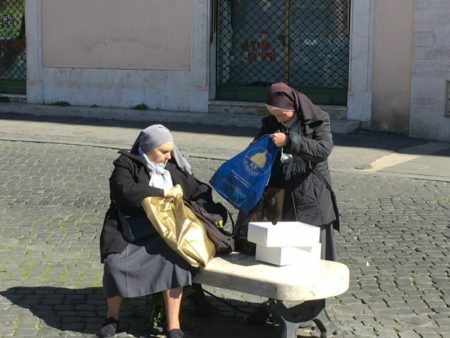 But what are these nuns looking for in their bags? This was my fourth trip to the Eternal city, hope the coin will help me return to Rome one day! Goodbye Rome and goodbye this great weekend! Did you know that the beautiful travel destinations of Tuscany and Florence are just 1,5 hours from Rome by train? 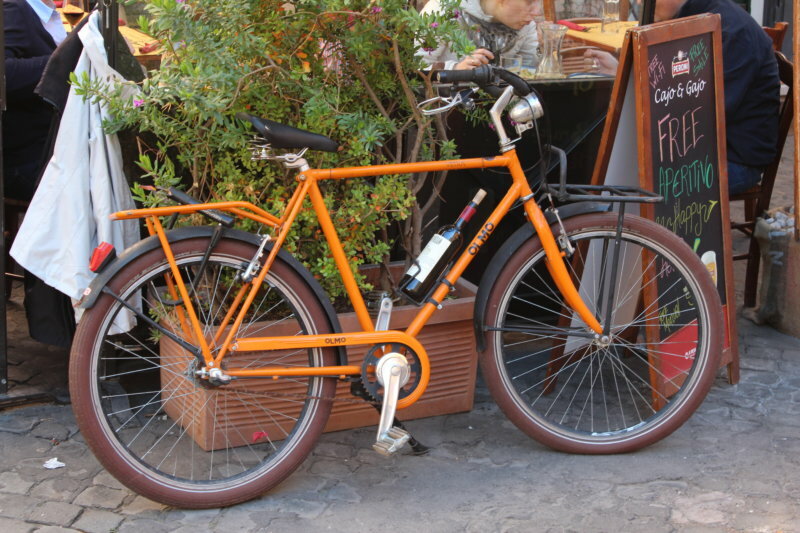 You can read about Tuscany in my other blog posts. What a wonderful description of a wonderful city. 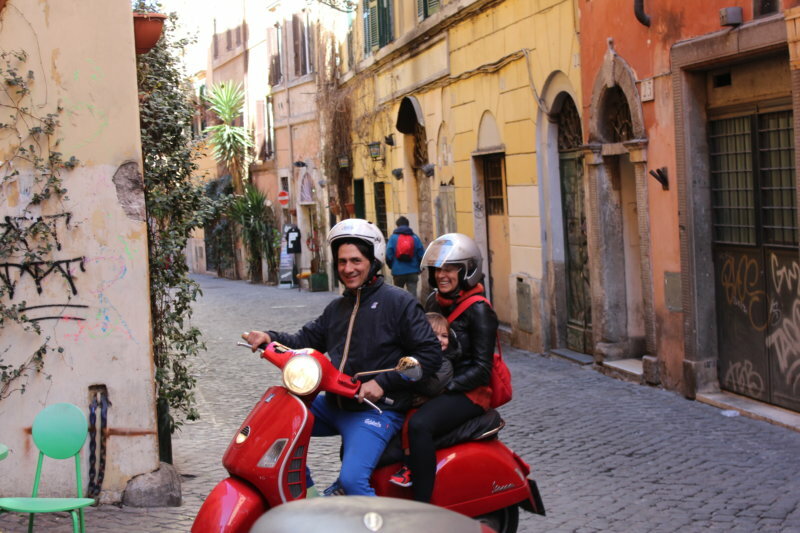 Rome is truly a city worth walking through since you always find attractions along the way. Another great tip is whilst taking a walk on the evening to pop into the smller cathedrals on the way. 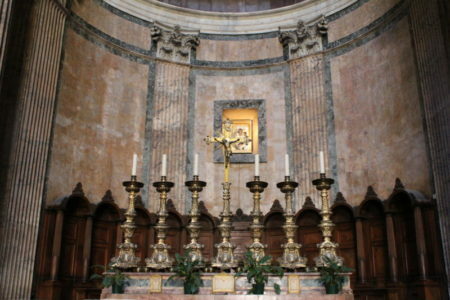 In the smaller cathedrals you truly get to study the art work close up and the atmosphere is very cozy, more so compared to the big tourist cathedrals.